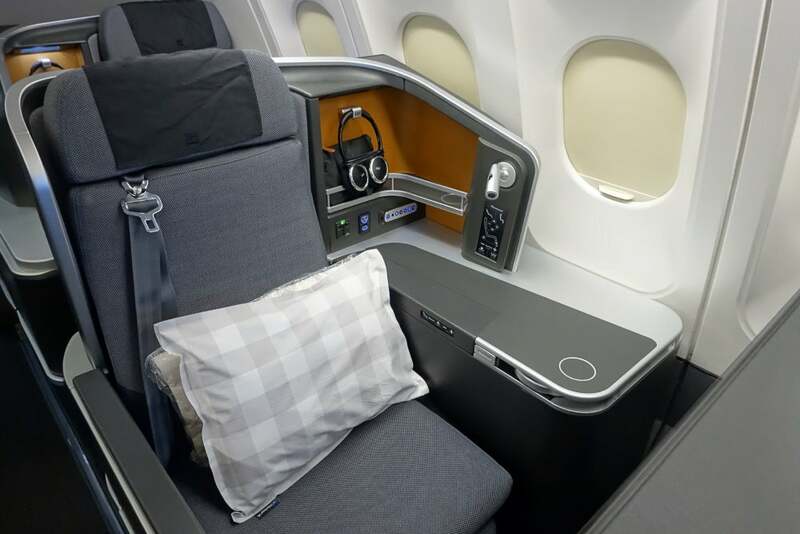 TO THE POINT: Scandinavian’s new lie-flat A330 business class is absolutely fantastic. 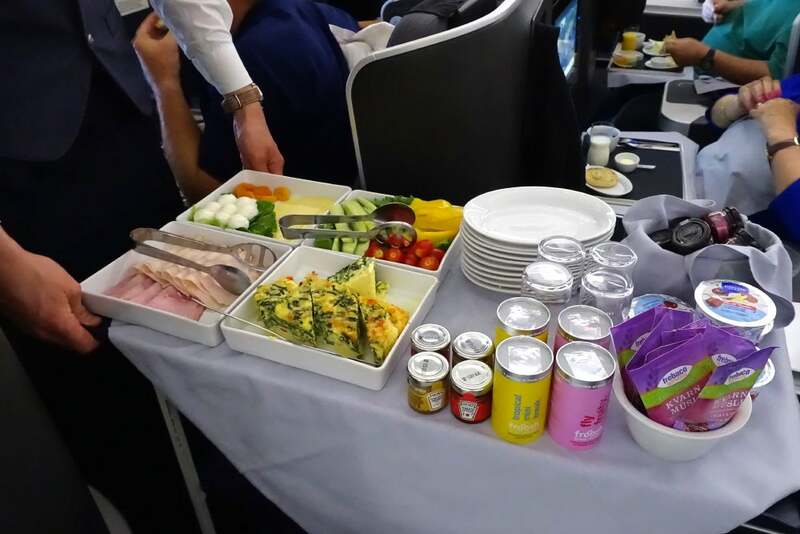 The pros: ultra-private seats, excellent flight attendants and top-notch food. The cons: award availability can be a bit hit or miss. However, after a 30-minute maintenance delay (that seemed likely to be extended), I decided to cut my losses and make my way over to an even more compelling alternative, instead. 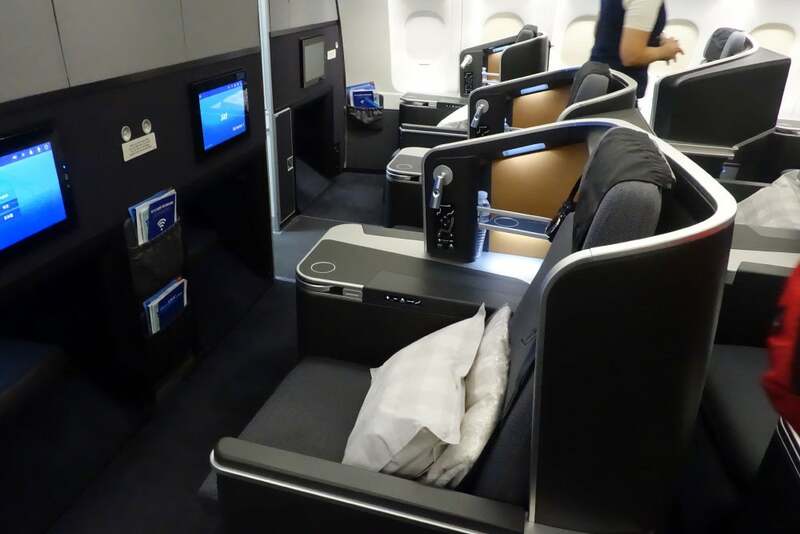 Normally, I’d first try to book a business-class flight using miles, but I happened upon a United fare so low that it didn’t even make sense to check for award space. I had a flight out to the UK for the Farnborough Air Show, but as of a couple months out I still hadn’t booked my return. 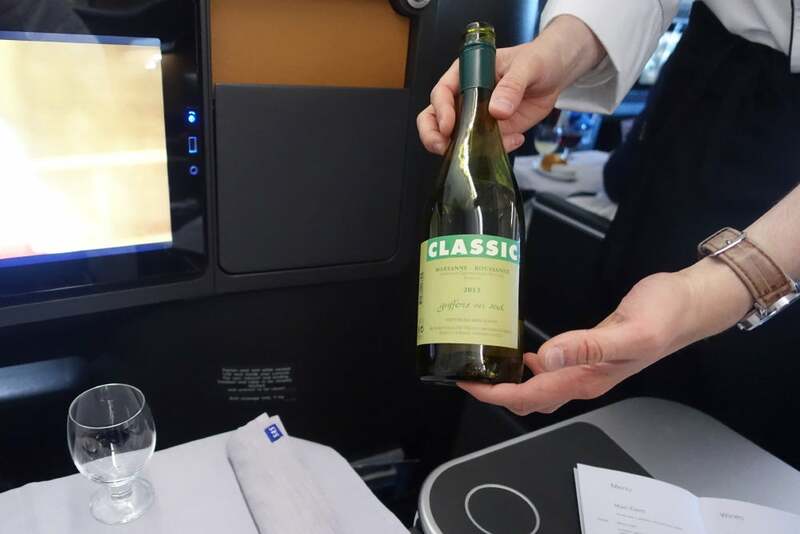 Fortunately, an incredible business-class “P” fare popped up, bringing me from Oslo to Seattle and back for about $650. 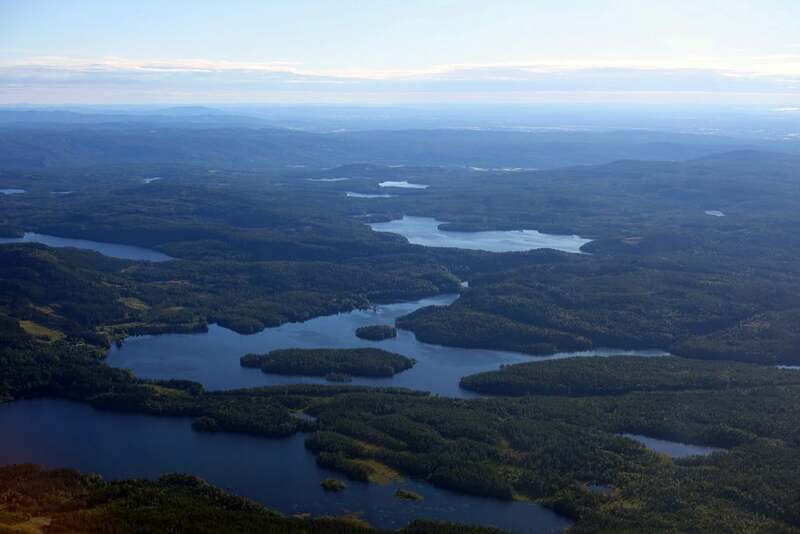 So, when it comes to flights to and from Oslo, a revenue ticket does often make more sense. While I didn’t originally have plans to visit Seattle around that time, it just so happened that Boeing’s 100th birthday celebration would be taking place on my one full day in town, so that worked out very nicely. On top of that, my United flight from Oslo to Newark was delayed, so I asked United to put me on a Delta nonstop from Amsterdam to Seattle instead — the agent processed that right away (and was incredibly friendly and patient during our brief call), so I ended up flying long-haul Delta One for the first time, and earning United miles in the process. 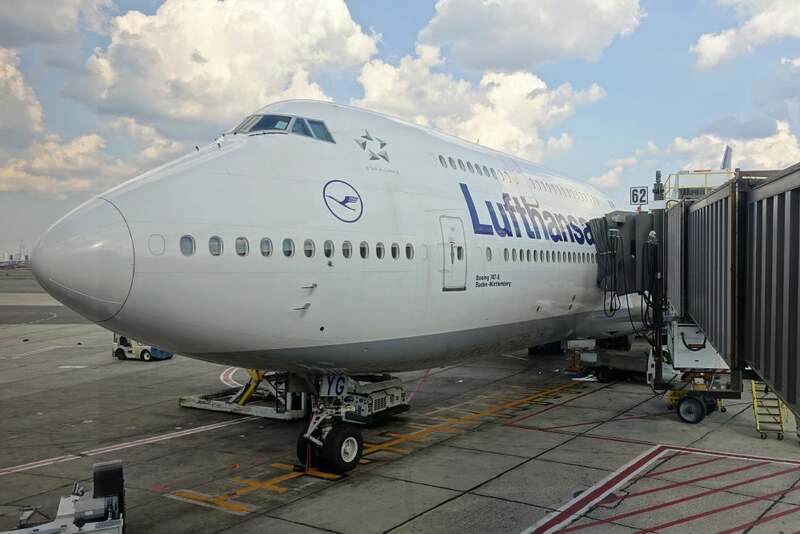 I arrived at Newark Airport a bit over two hours before departure, with my Lufthansa boarding passes in hand. 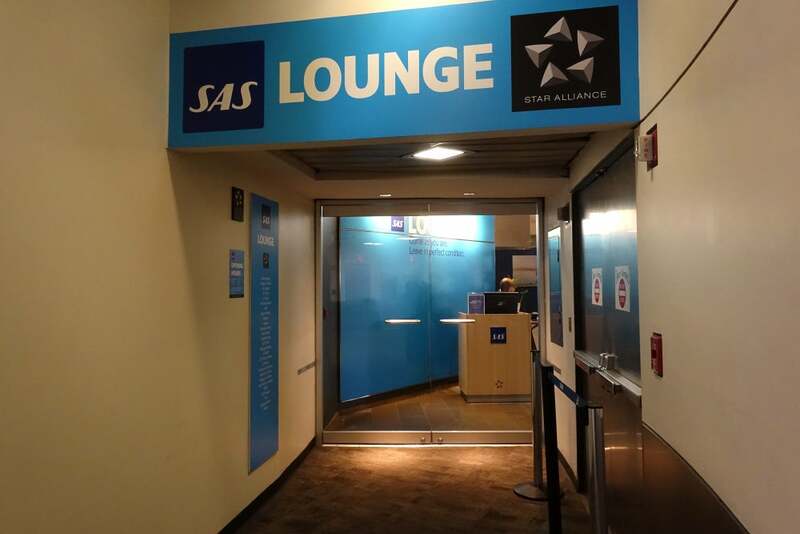 Even though Scandinavian wasn’t on my itinerary, my first stop was the SAS Lounge, which I could access as a Star Alliance Gold member flying Lufthansa. 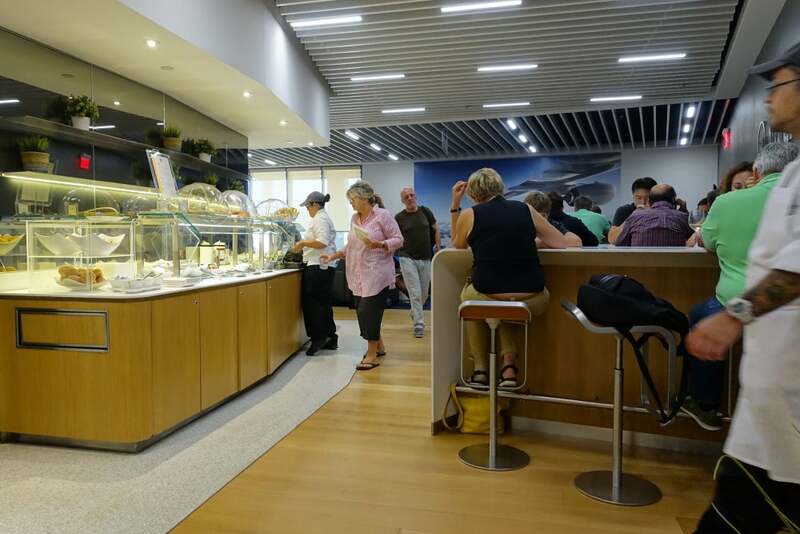 The lounge was pretty underwhelming, with a small food counter (which always seemed to be occupied, hence the not-so-great shot). And a very mediocre self-serve bar. There were a few different seating options, including chairs and high-top tables, but overall I was ready to leave just a minute or two after arriving. 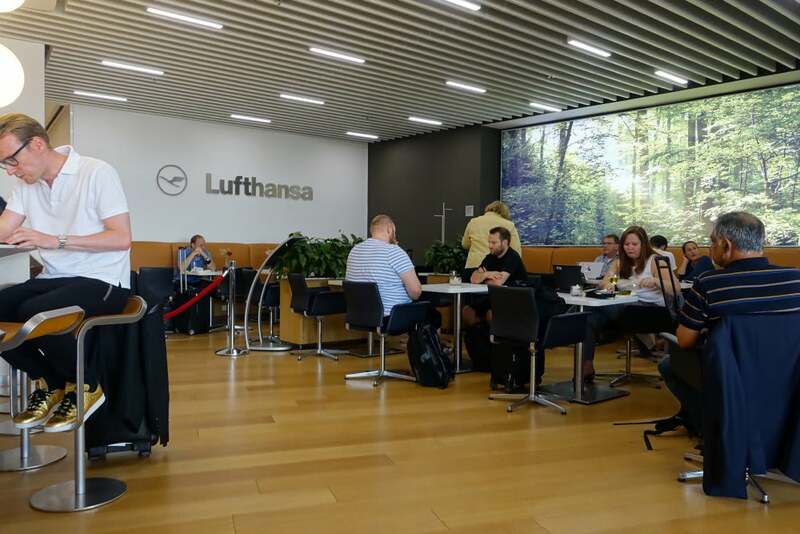 Given that I was planning to review Lufthansa, I headed across the hallway to the airline’s two lounges. 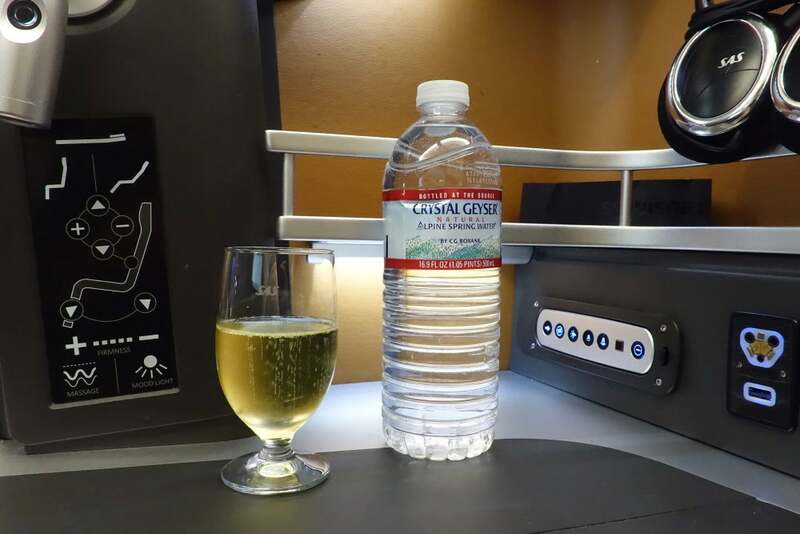 As a business-class passenger with United 1K status I had access to both the Senator Lounge and the Business Lounge — the latter of which is smaller, more crowded and overall less appealing. 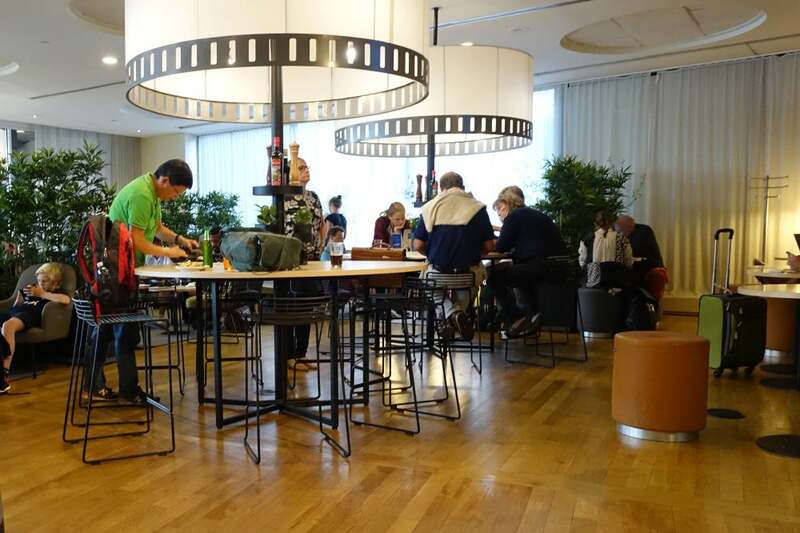 The Business Lounge had a small hot and cold buffet and a variety of seating, but it was packed. The Senator Lounge, meanwhile, had much more seating and fewer guests, but it was still very crowded. 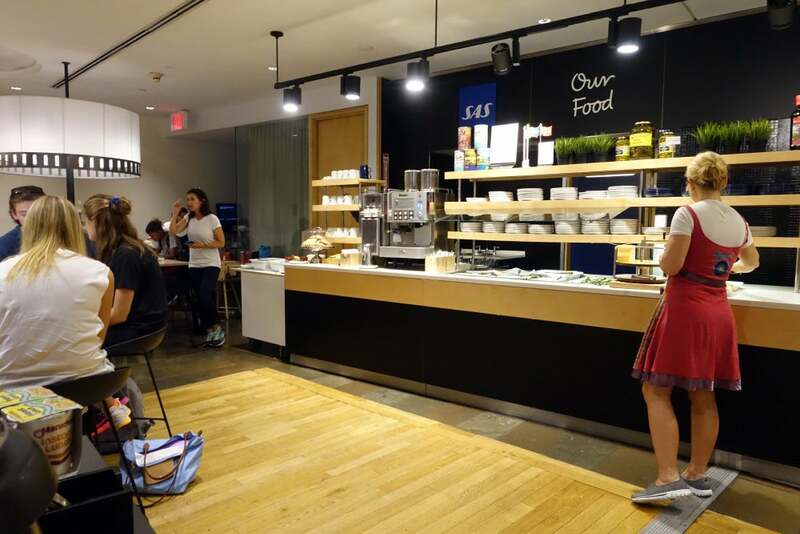 Lufthansa doesn’t have a first-class lounge at Newark, unfortunately, though it has an absolutely fantastic lounge at JFK. 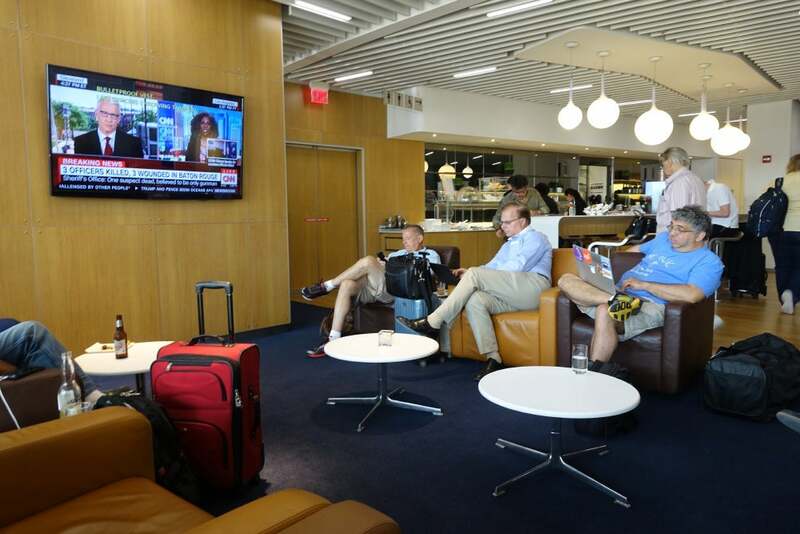 At EWR, first-class passengers get to sit in a roped off section of the Senator Lounge (behind the red rope, shown below). 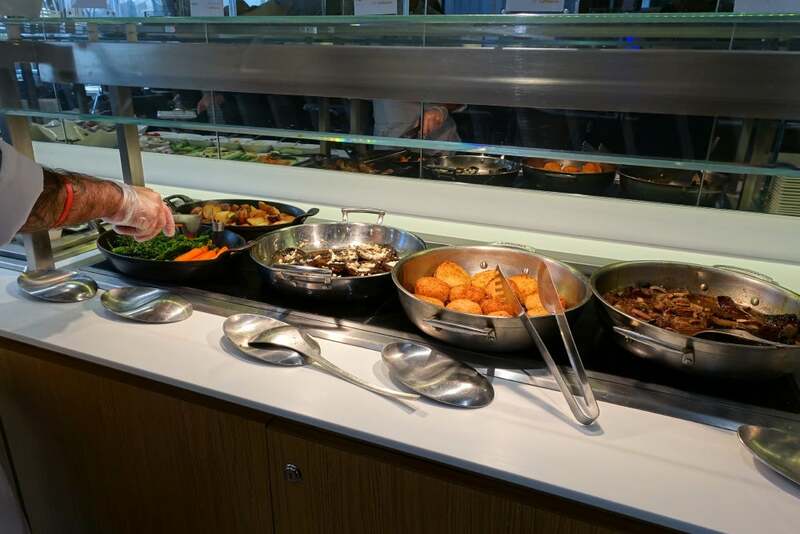 All passengers have access to the same cold buffet. Along with a few hot items — the steak was delicious. 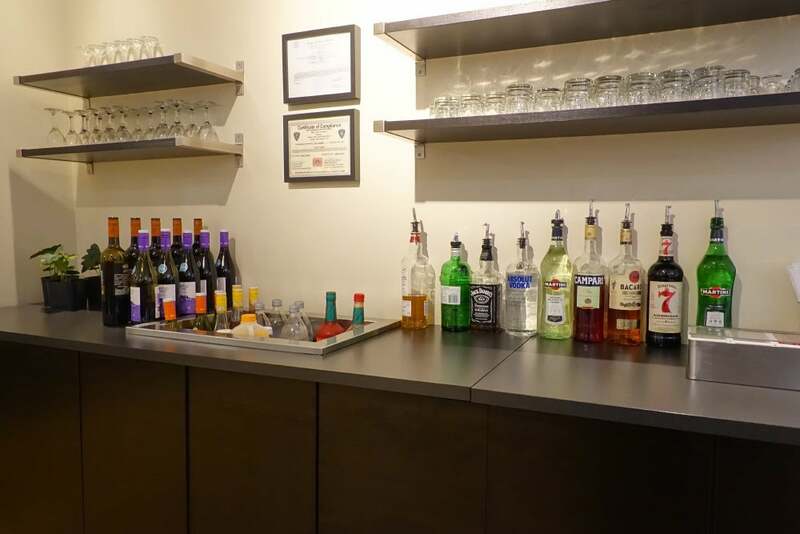 There are also a couple draft and bottled beers, and a far better booze selection than you’ll find at SAS across the hallway. 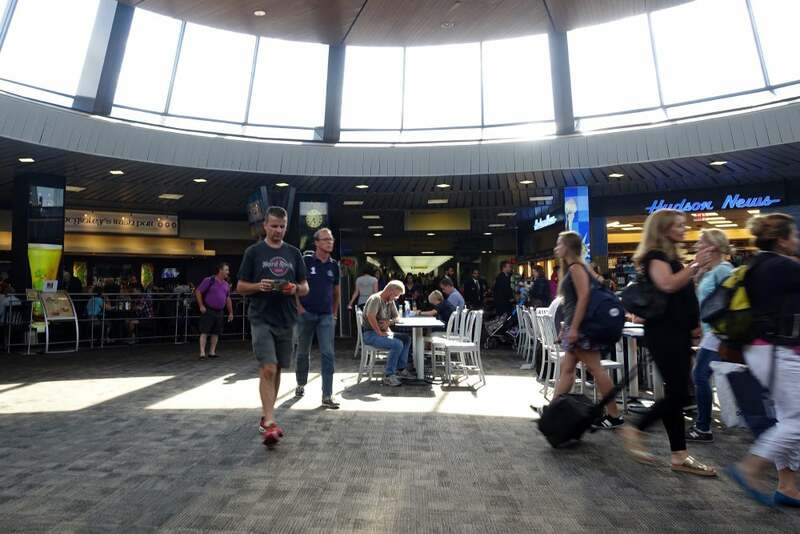 After 30 minutes or so in the lounge, I headed out to check out the terminal, which was cramped and outdated. 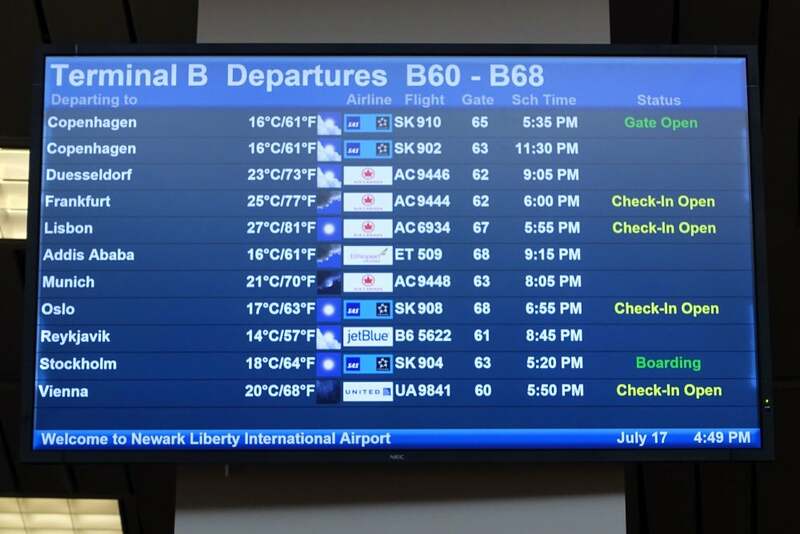 I wouldn’t plan to spend any time exploring, shopping or eating here — the less time you have to wait at Newark’s Terminal B, the better. 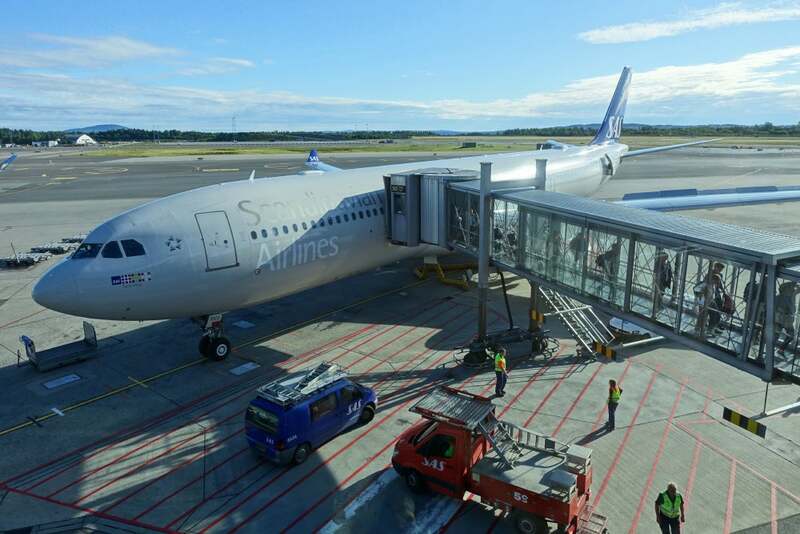 As I mentioned, I ended up getting to fly Scandinavian’s nonstop to Oslo, instead of my planned connecting flight on Lufthansa. Below is the plane we flew, though this picture was captured upon arrival at OSL, since I didn’t have time for any photo ops at Newark. 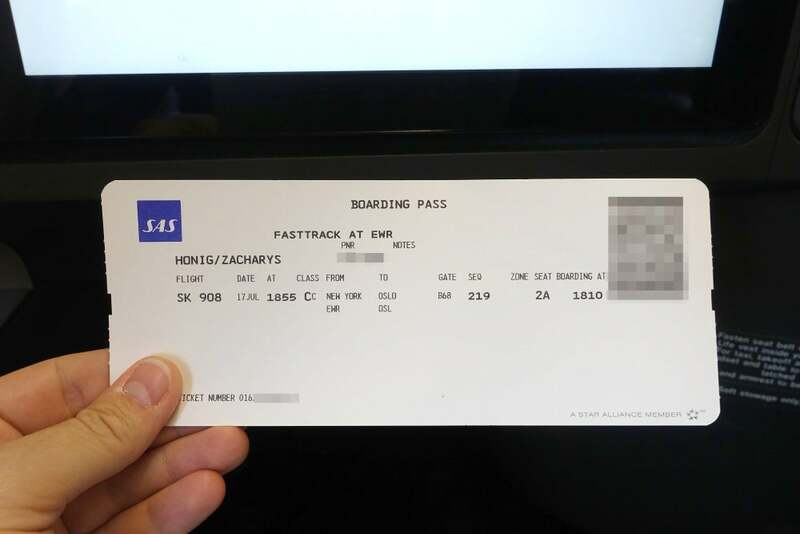 With my new boarding pass in hand, I walked through the jet bridge and onto the plane, which was already well into the boarding process. Normally, I do my best to photograph each cabin before taking my seat, but given the last-minute change, that wasn’t a possibility, so I just headed straight to the front of Scandinavian’s A330. 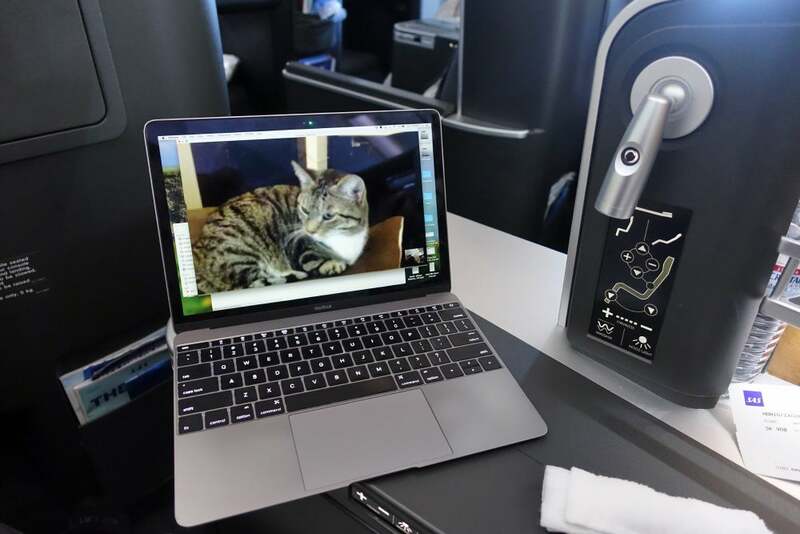 The airline doesn’t offer first class, so business begins just behind the cockpit. 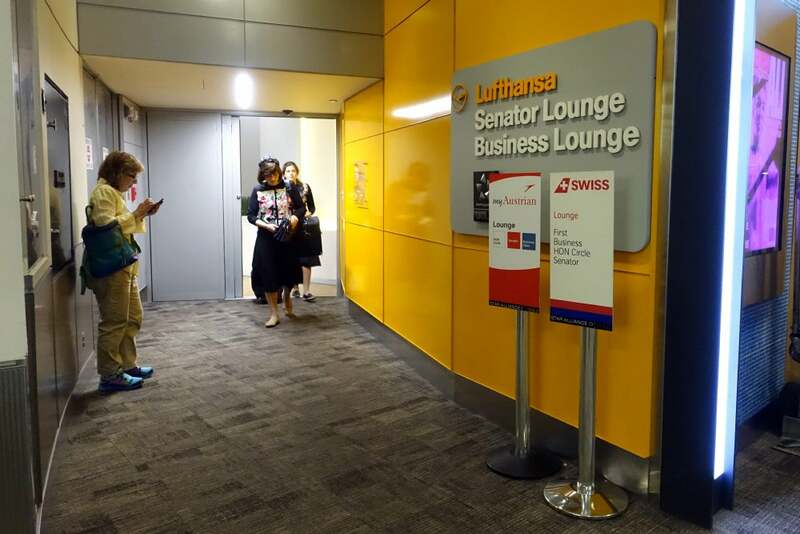 Unlike on some other A330s, passengers aren’t permitted to enter the forward section, which contains a lavatory and crew rest area. 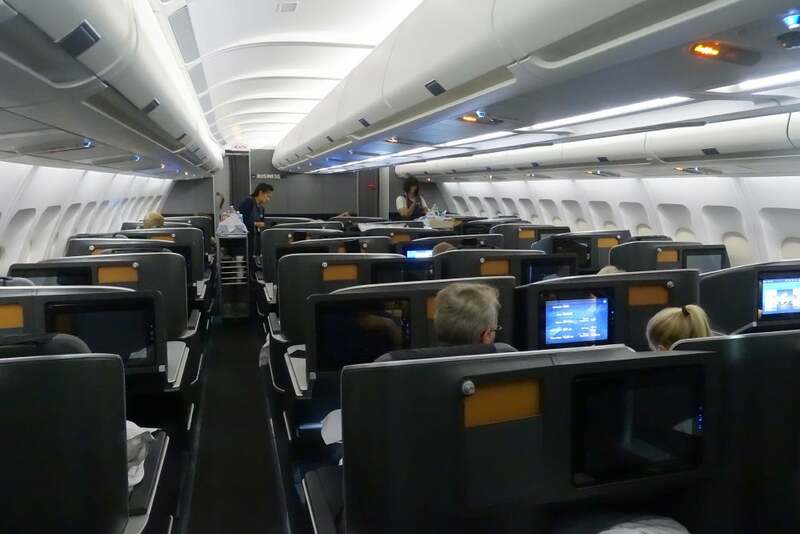 The cabin consists of 32 lie-flat business-class seats arranged in a staggered 1-2-1 configuration. 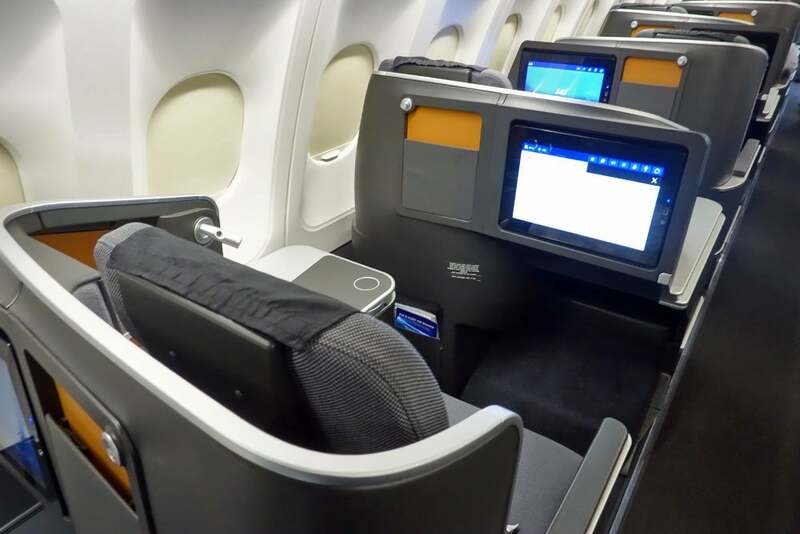 The center seats aren’t ideal, though they’re certainly better than what some other airlines offer. 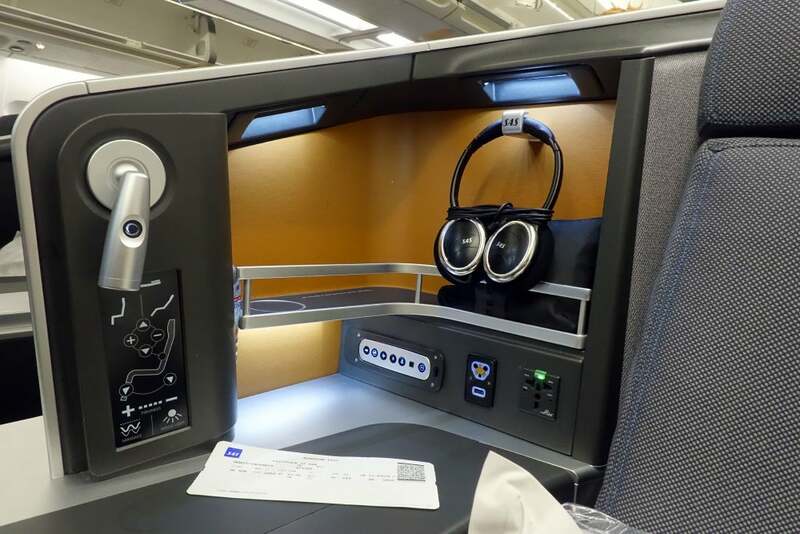 The window seats are what you’re after, though the seats in even rows (2, 4, 6 and 8) offer more privacy than those in odd rows (pictured below), since they’re positioned right up against the window. 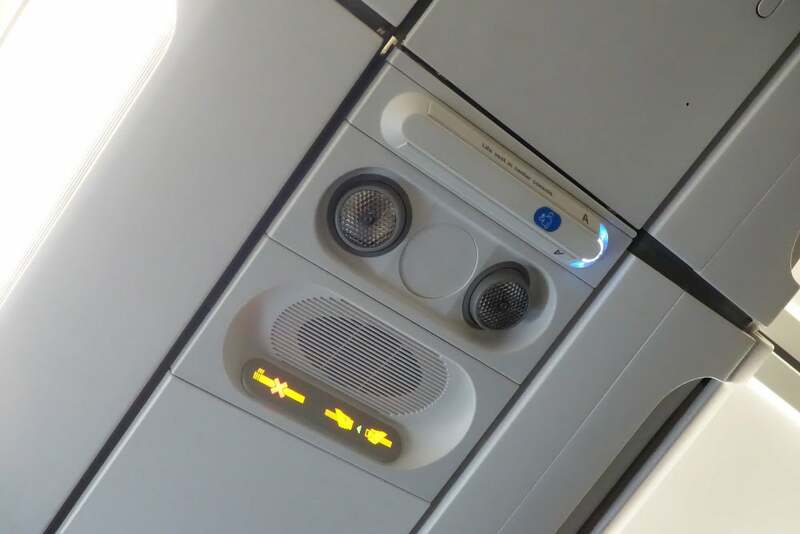 The aircraft doesn’t offer dedicated air vents, which was unfortunate because the crew kept the cabin fairly warm. 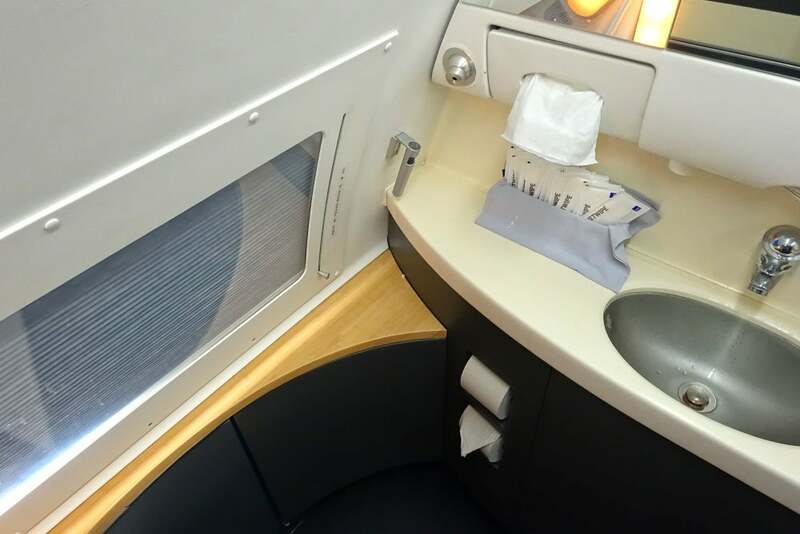 There are two lavatories at the back of the cabin (the one up front isn’t accessible to passengers). 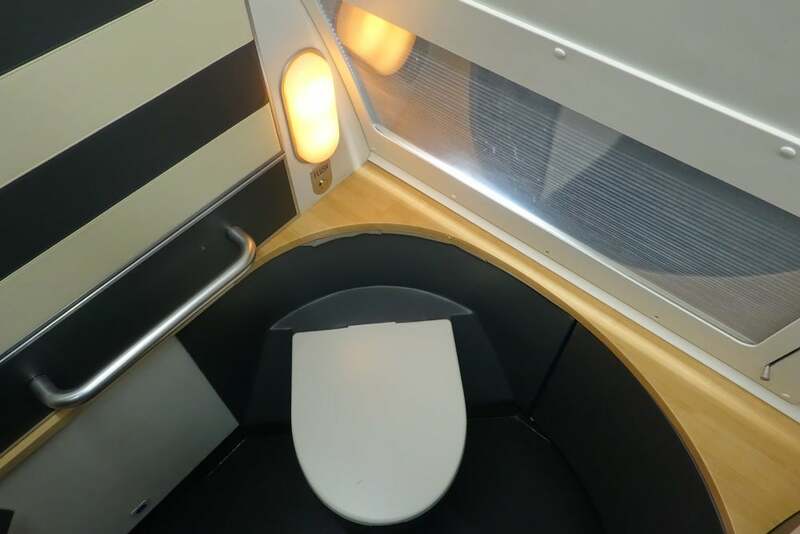 Normally one or two lav pics would suffice, but these particular bathrooms offered a pretty unique feature, mechanical blinds — just make sure they’re pulled down when the plane is on the ground! 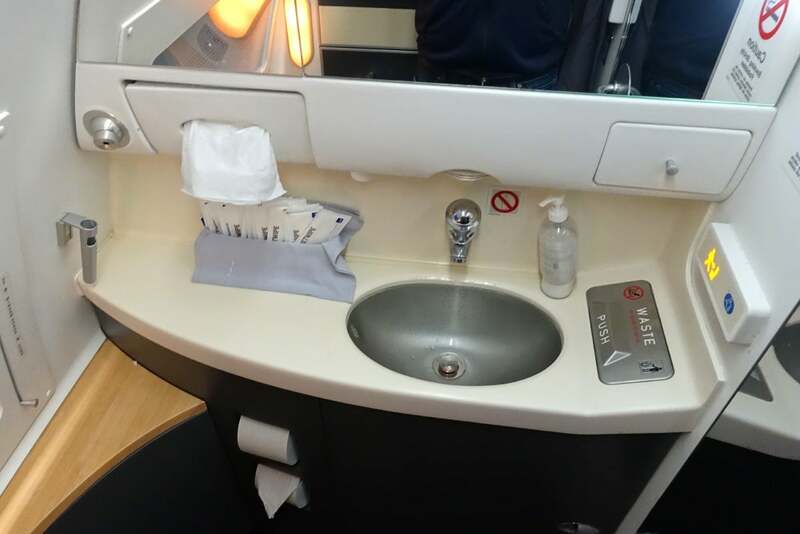 Otherwise, the lavatory was fairly typical — it wasn’t super-cramped, but there wasn’t room to move around much, either. The decor was definitely a bit different than you’ll usually find, though! And finally, the moment you’ve all been waiting for — time to check out the seat. I photographed one of the odd-row window seats (since my section of the cabin was already quite crowded when I boarded), but the seats are identical (just reversed in the even rows). 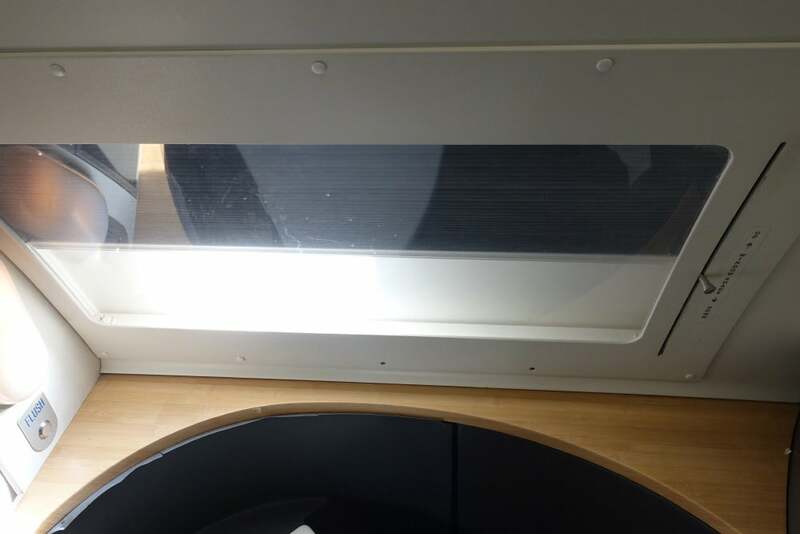 There’s a decent-size footwell beneath the display, which is where I opted to store my blanket and shoes. Then there’s some additional storage off to the side, along with the seat and entertainment controls. The entertainment controller pops out from its cubby, but I found it easier just to tap the screen. 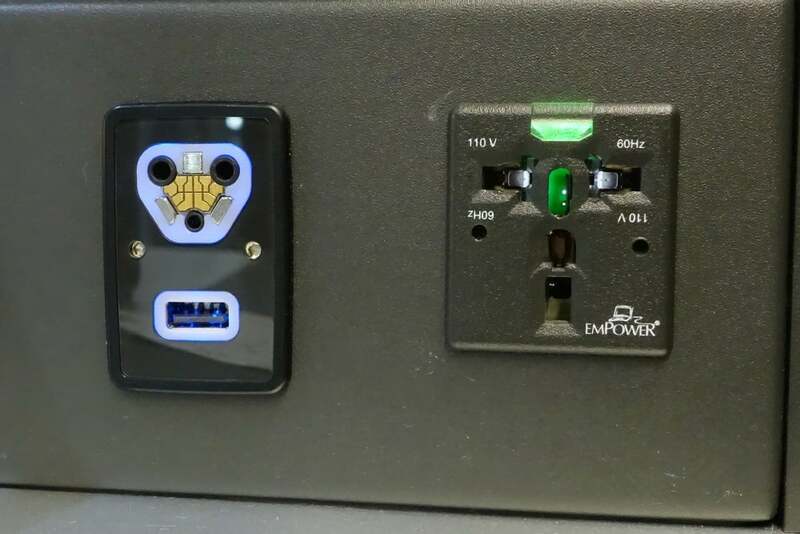 There’s also a headphone jack, a USB port and a universal power outlet. 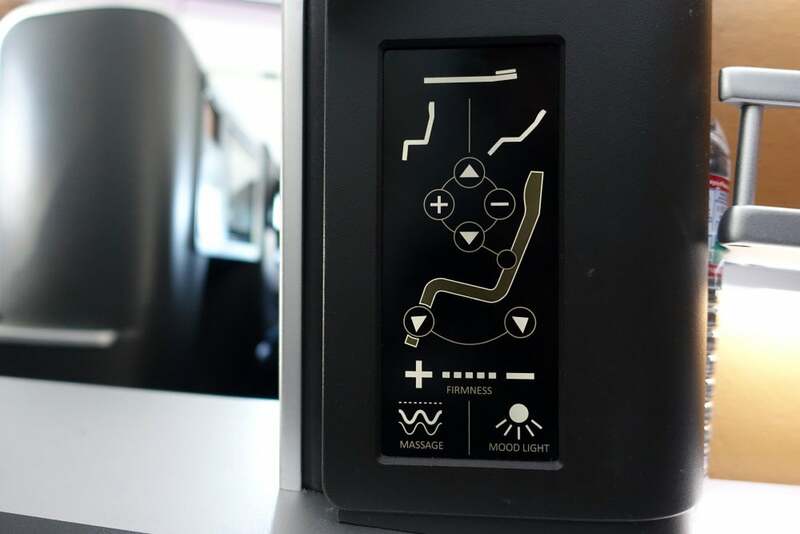 The seat controls are fairly straightforward and responsive — no complaints here. 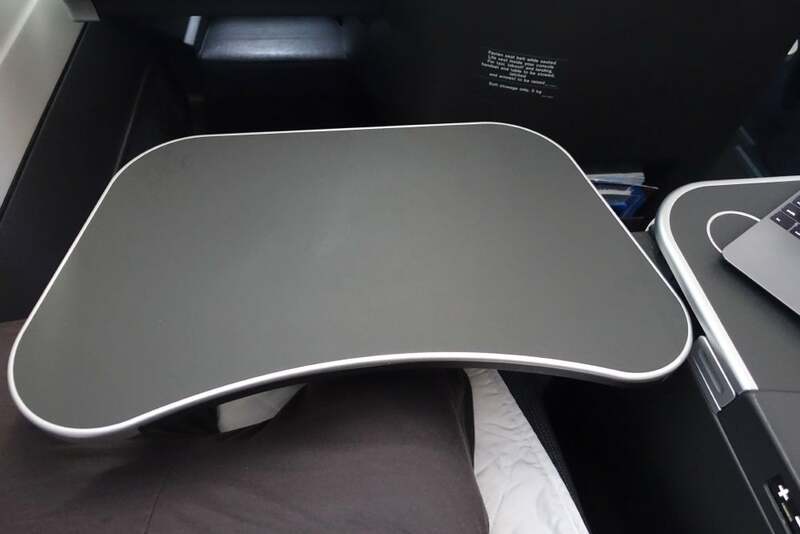 There’s also a tray table that folds out from the side console, and can move forward and back and off to the side. 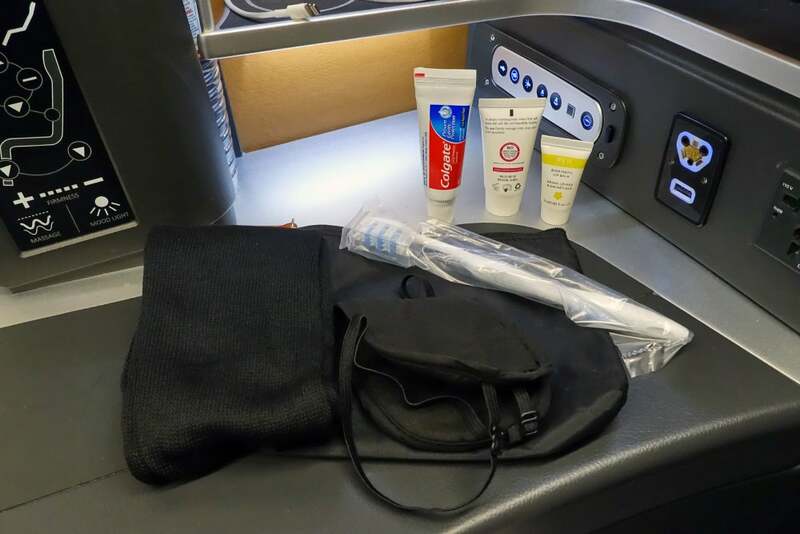 Waiting at my seat was the exact same amenity kit I received on my SAS 737 flight last year — it’s practical and the pouch is worth saving to store cords and other miscellaneous travel items. 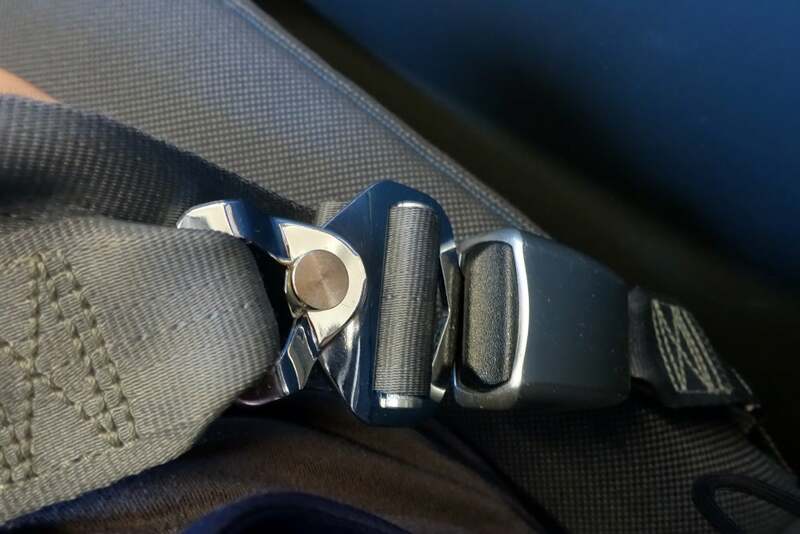 Business-class seats also have a new seatbelt design, which was a bit different than what I’m used to. 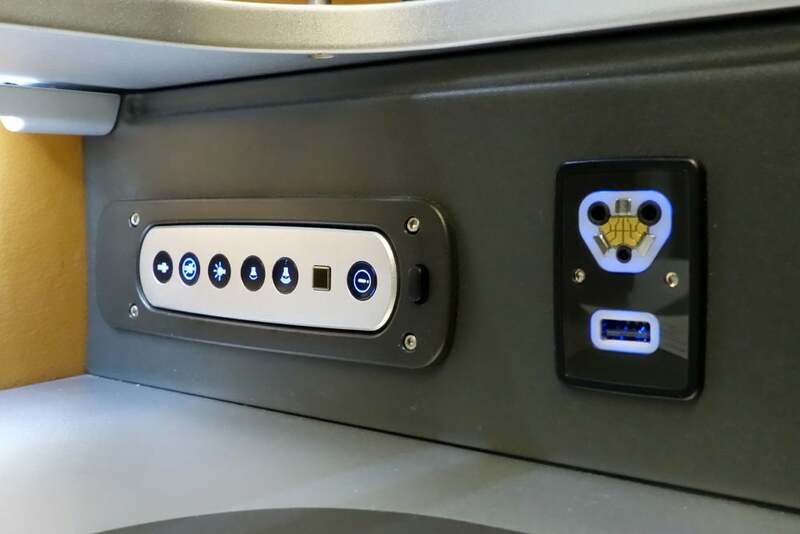 The receptacle is actually very similar in design to what you’d find in a car, and there’s a shoulder strap as well, which you need to wear for taxi, takeoff and landing. 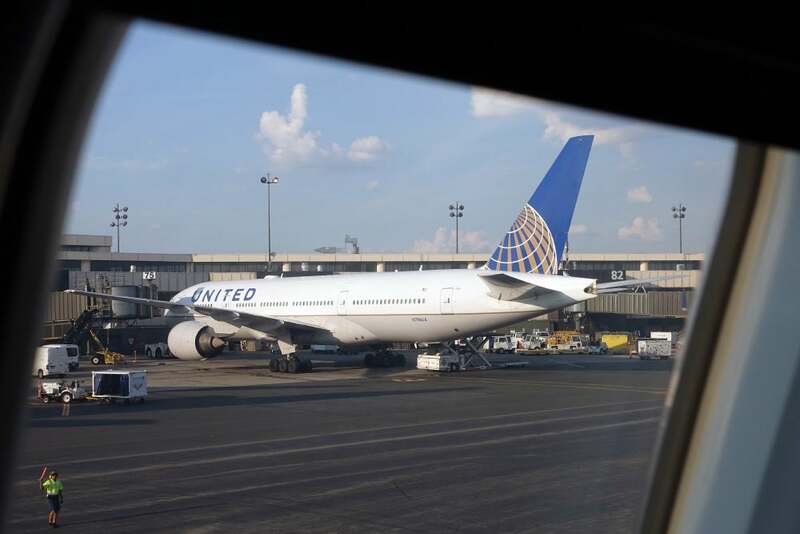 We taxied past the much more attractive Terminal C, which is home to most United flights (including UA’s nonstop to Oslo, which I had considered moving to as well). 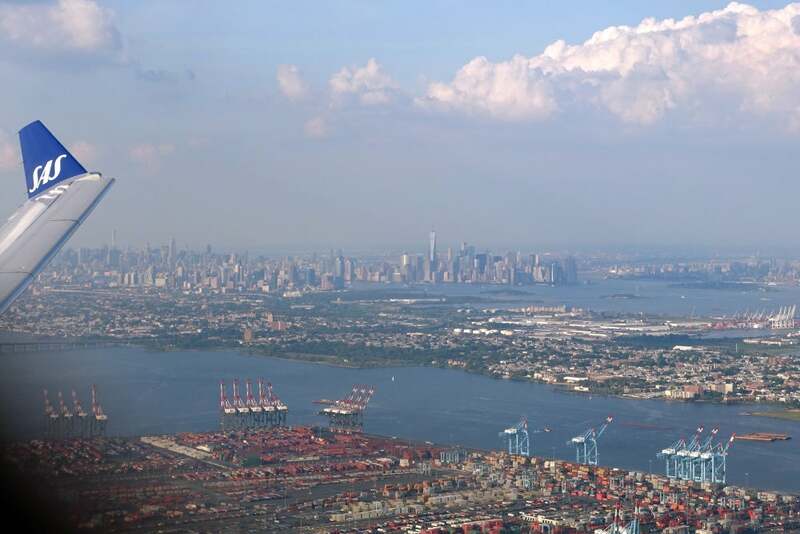 Then, after waiting for a few minutes, we were airborne, flying just past the NYC skyline. 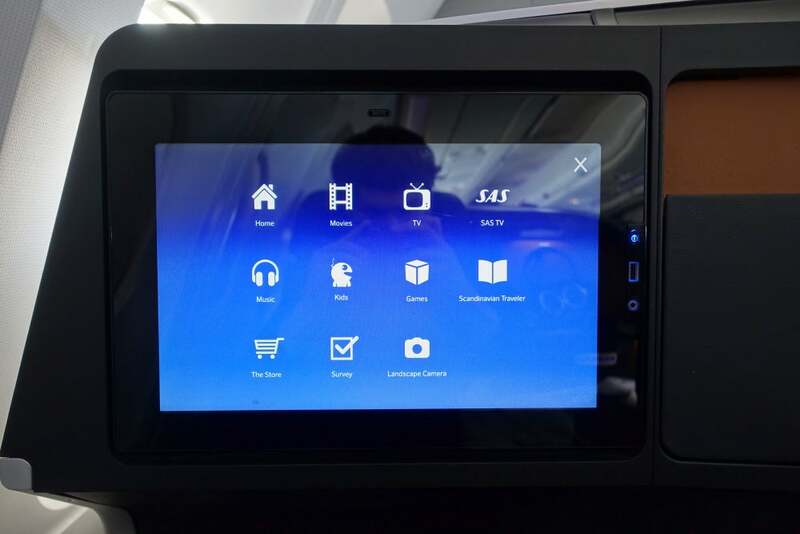 After takeoff I started poking around the in-flight entertainment system — business seats have a 15-inch touchscreen, which offers a headphone jack and USB port of its own. You can choose from a handful of movies, TV shows, SAS content, music and games, among other features. 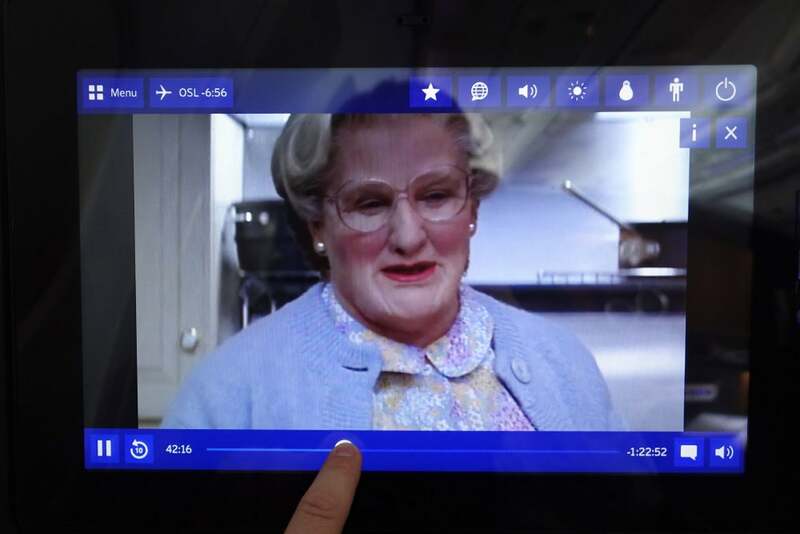 Unfortunately the “Landscape Camera” (listed below) didn’t appear to be connected on this flight. 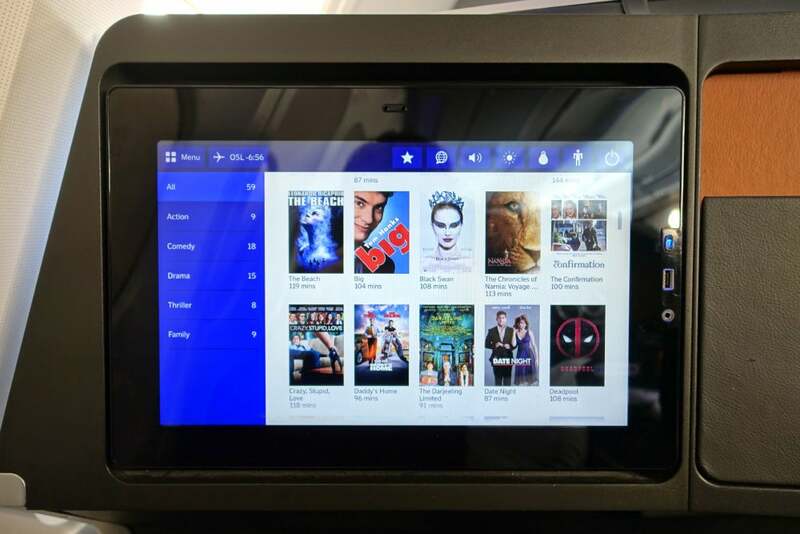 The airline offers a healthy selection of new releases and older films. The system is up-to-date, so you can do things like slide your finger along the timeline to jump ahead in a movie, for example. There was also a ton of SAS content, including the selections below. 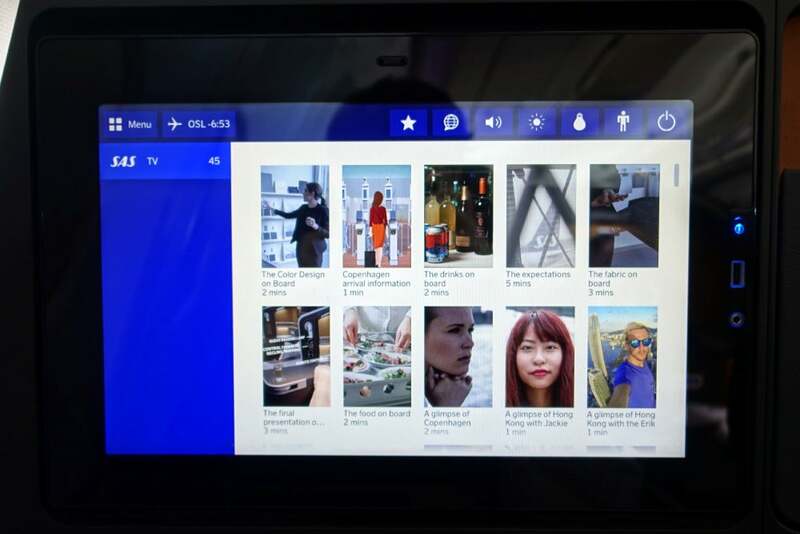 I imagine this content doesn’t appeal to most passengers — options included a three-minute video detailing the materials used in building the new A330 cabin, for example. 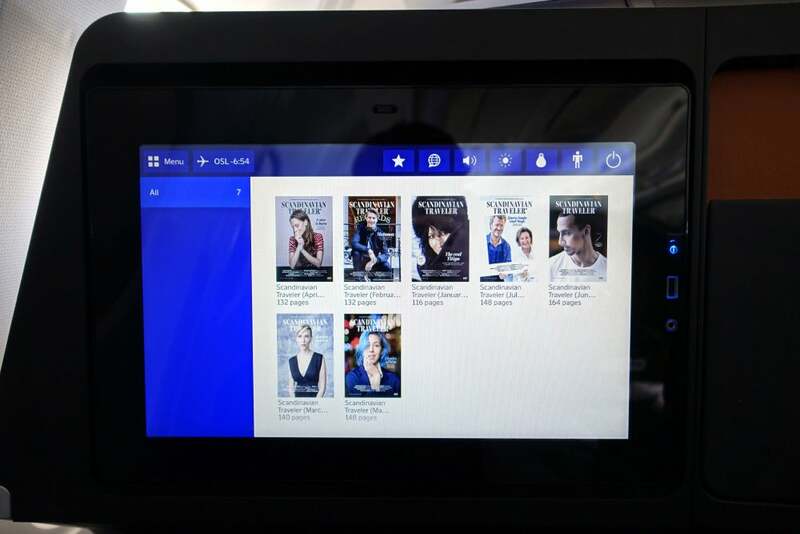 You can also access the airline’s in-flight magazine, including back issues. And you can view the duty-free catalog, but you’re better off browsing the paper version in the literature pocket, instead. 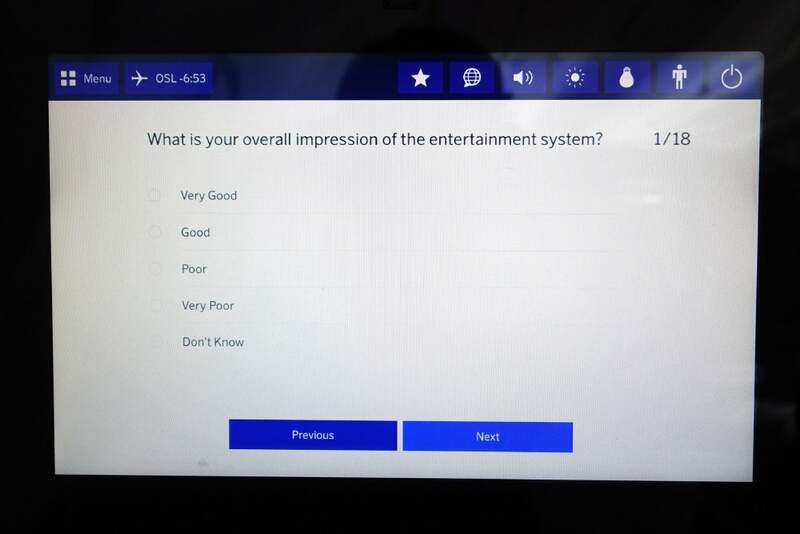 There’s even an in-flight survey! Which I, uhh, didn’t have time to complete. 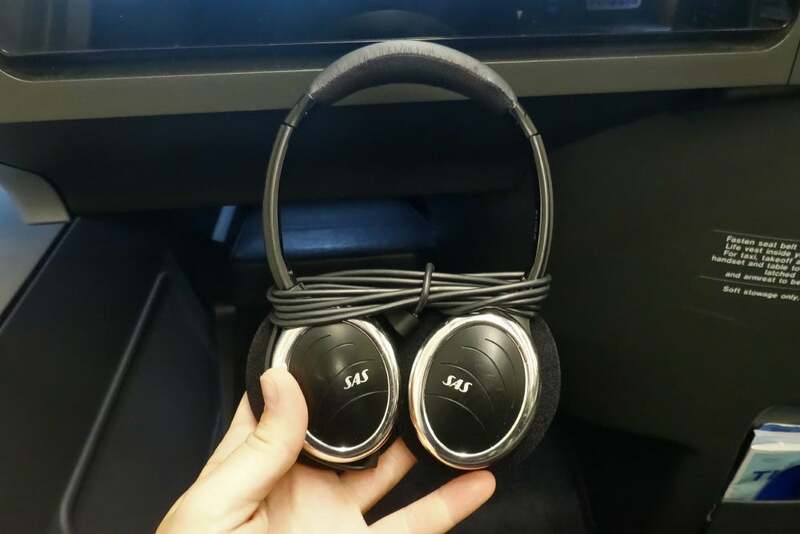 The provided headphones were definitely a low point — SAS would really benefit from adding some Bose noise-canceling headphones, instead. 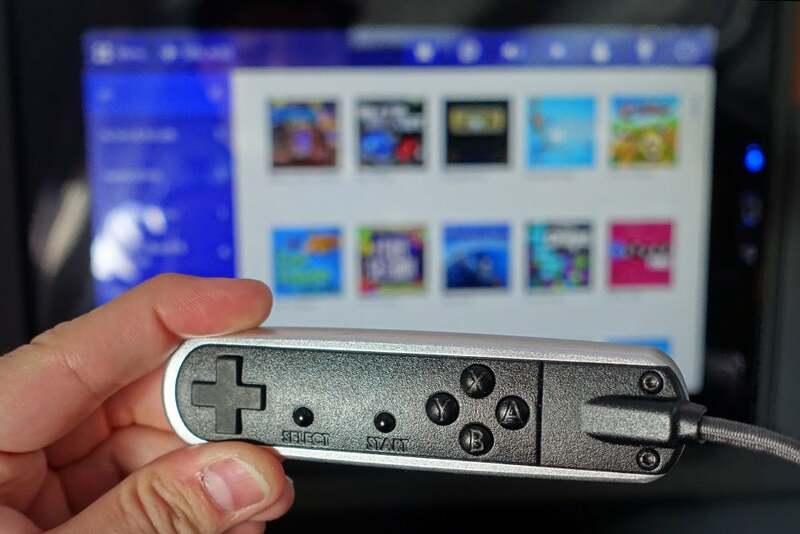 And then there’s a handheld remote, which you really only need to use when playing games. 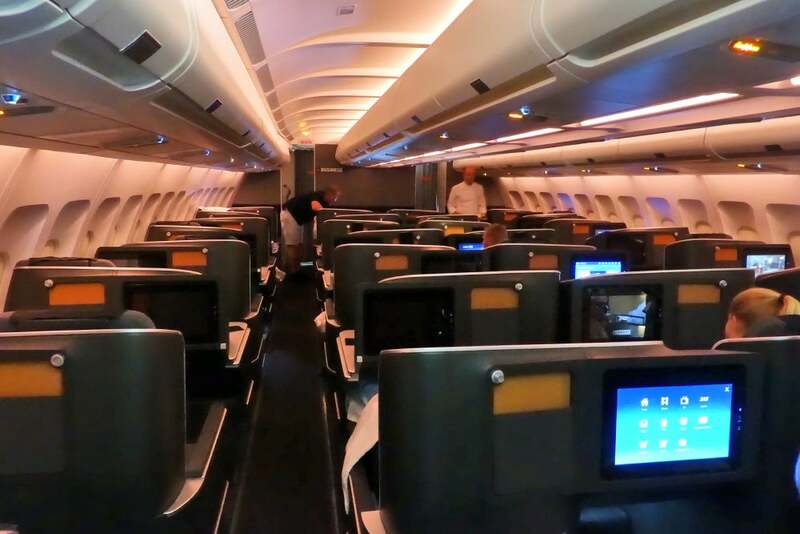 Not only does this plane offer in-flight Wi-Fi — it’s free for business-class passengers! Technically, you can log in using your name and confirmation number, but that didn’t work for me, so the flight attendant needed to type in her credentials, which she was happy to do on both my laptop and my iPhone. As you can see above, it wasn’t super fast, but I didn’t have any issue FaceTiming my cat! 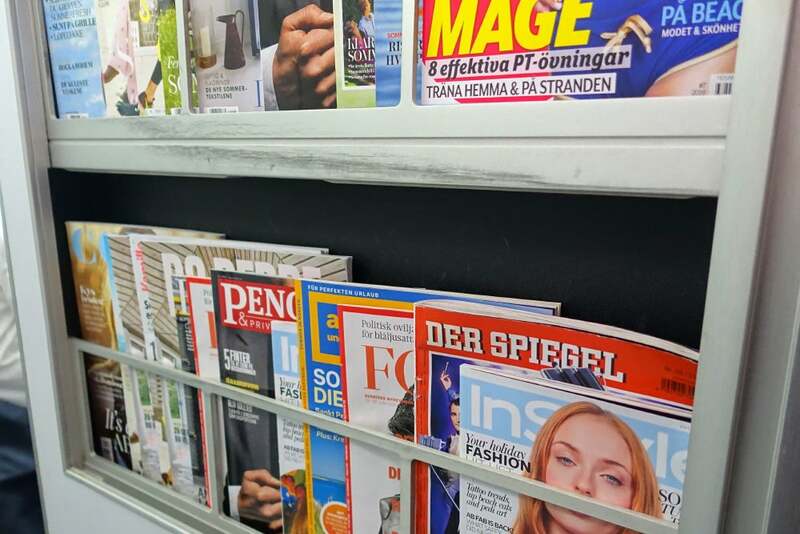 If all else fails, you can choose from a selection of magazines located at the rear of the business-class cabin. 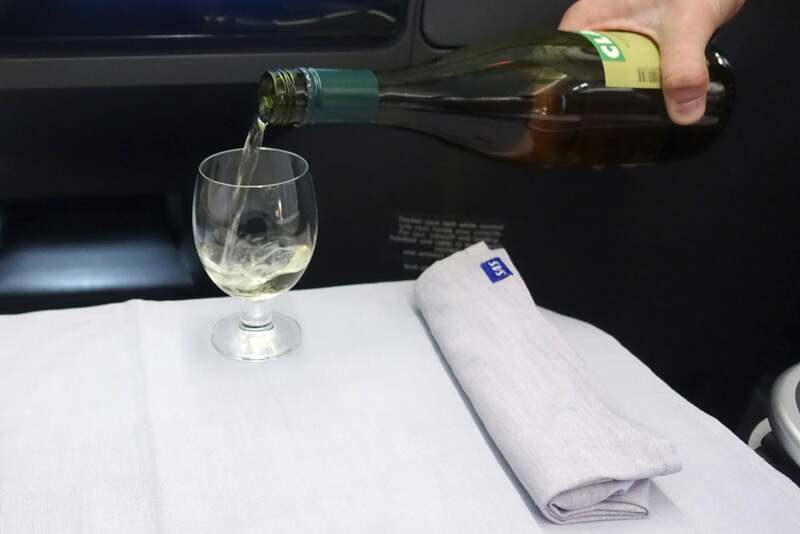 Moving on to F&B — there was a bottle of water waiting at my seat, and a flight attendant came by with Champagne (a 2008 Heidsieck) just after I took my seat. 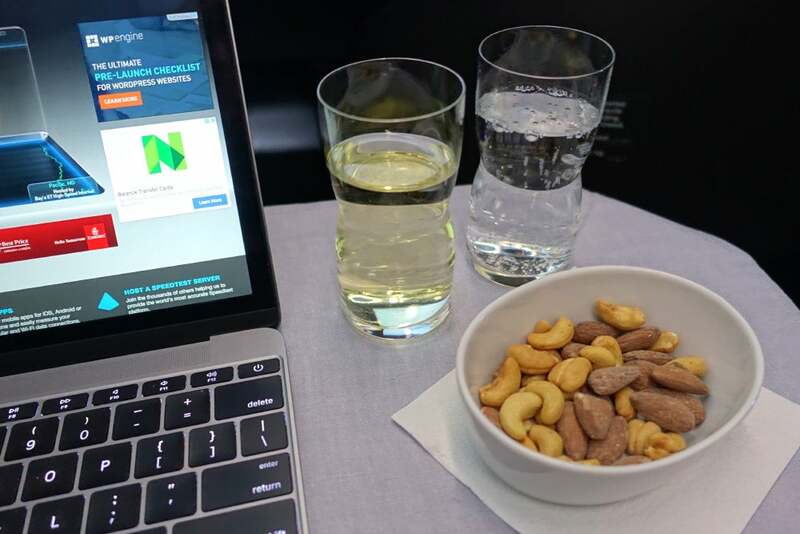 After takeoff, I had some more Champagne along with sparkling water and a pretty large dish of mixed nuts. Since I was planning to have seafood for my entrée, I went with a white wine — it was one I hadn’t seen before, a 2013 “Classic Marsanne Roussanne” from Southern Rhone in France. 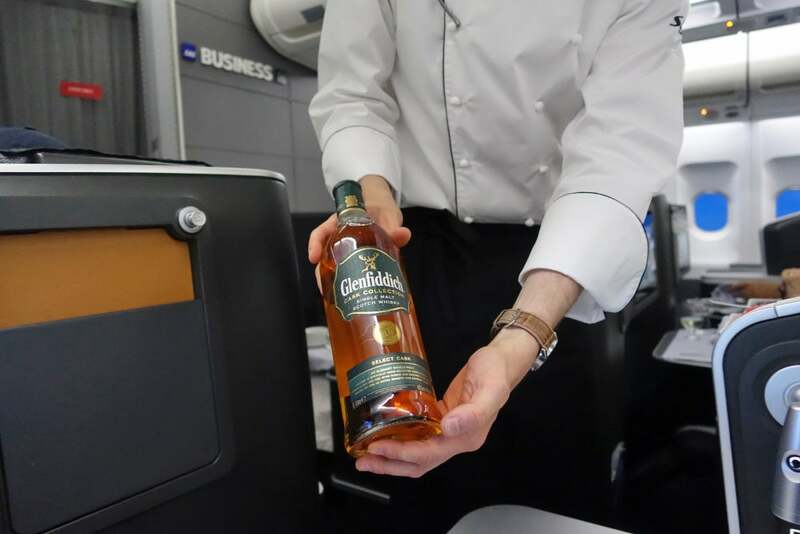 As with the Champagne and any other beverages, flight attendants present your pick before they pour. At this point, it became clear that I was taking a lot of photos, and given my experience on American last year (even with permission), I decided I might want to tone things down a bit. 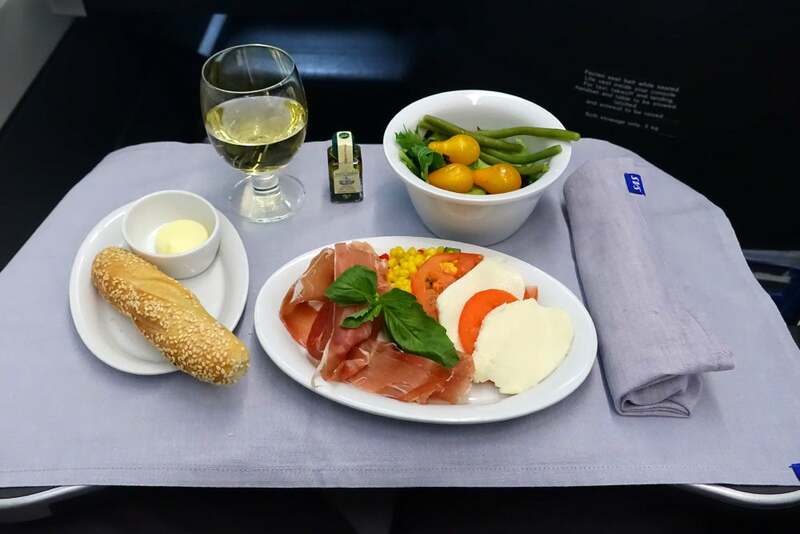 I snapped one picture of my appetizer, which consisted of a mixed salad, along with prosciutto with pearl couscous, mozzarella and tomato and a breadstick. A few moments later, the flight attendant came back over to my seat — but instead of asking me to put my camera away, she offered to take a picture of me! That was entirely unexpected, and very much appreciated. 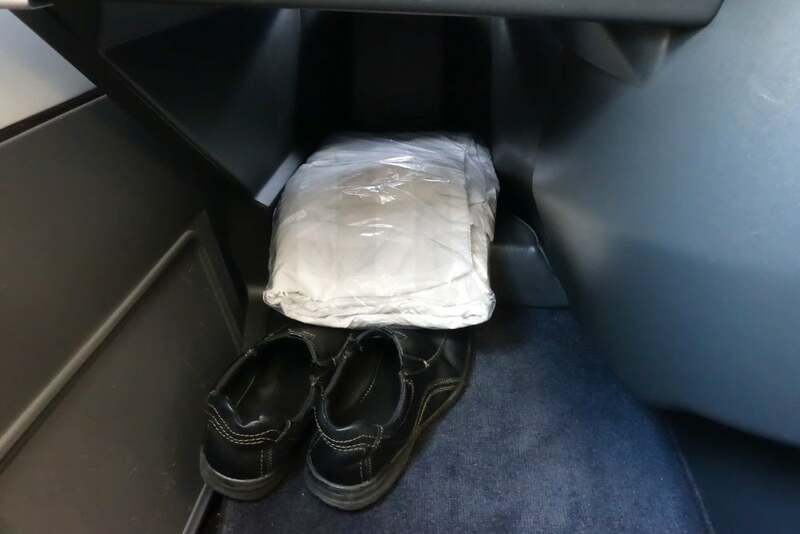 You can also see the seat cover that the flight attendant installed just after takeoff. The crew had been fantastic up until this point, but I was very relieved that they didn’t mind the photos. To put things into context, it might be normal to snap a dozen or so pictures as a passenger, but I tend to shoot hundreds — even though I don’t publish them all, I want to make sure I have usable photos of each “shot” I need to get during the flight. 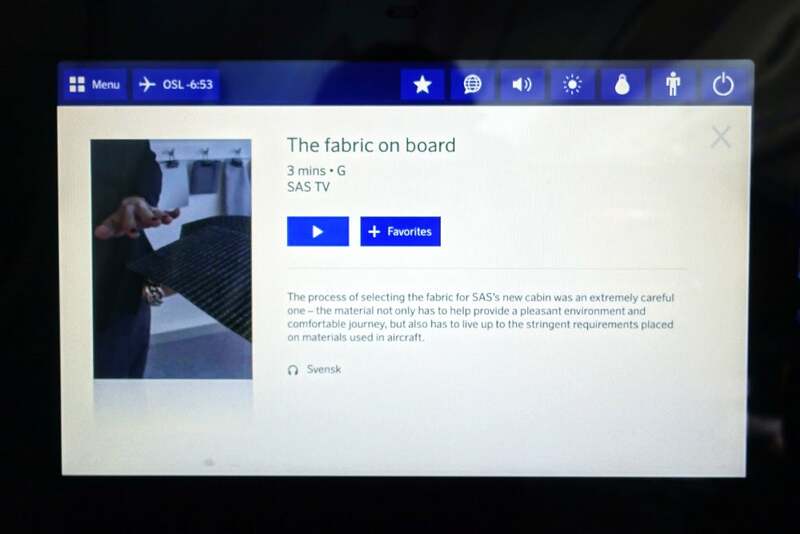 After a few minutes with my appetizer course, another flight attendant (this one dressed as a chef) came by with an entrée cart — that’s right, on SAS you can select your meal after you have a chance to check it out. 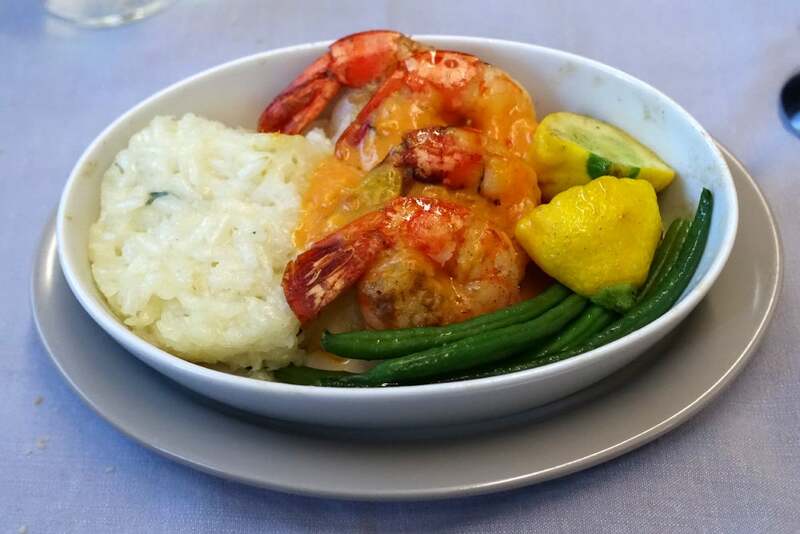 I went for the shrimp with basil risotto, green beans, squash and tomato. It was delicious. 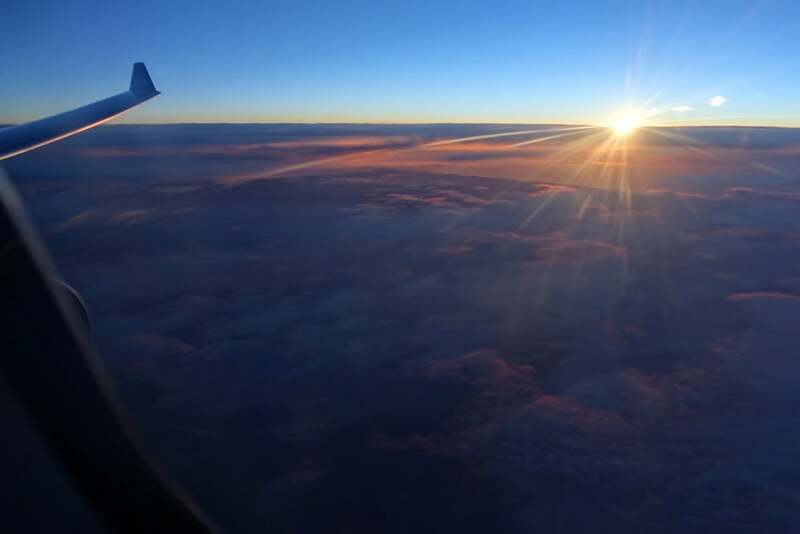 After finishing my main course, I opened the window just in time to see the sun setting below the clouds somewhere over eastern Canada. 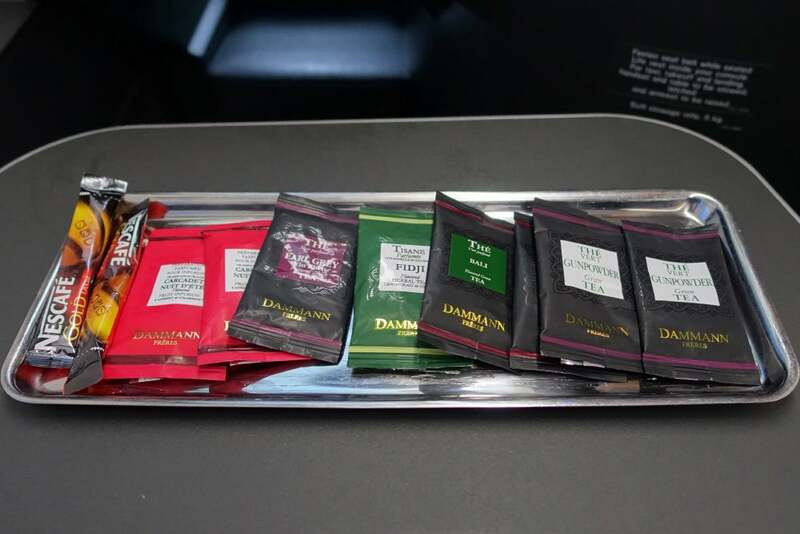 Then, a flight attendant came by offering tea — which she let me choose from the selection below. 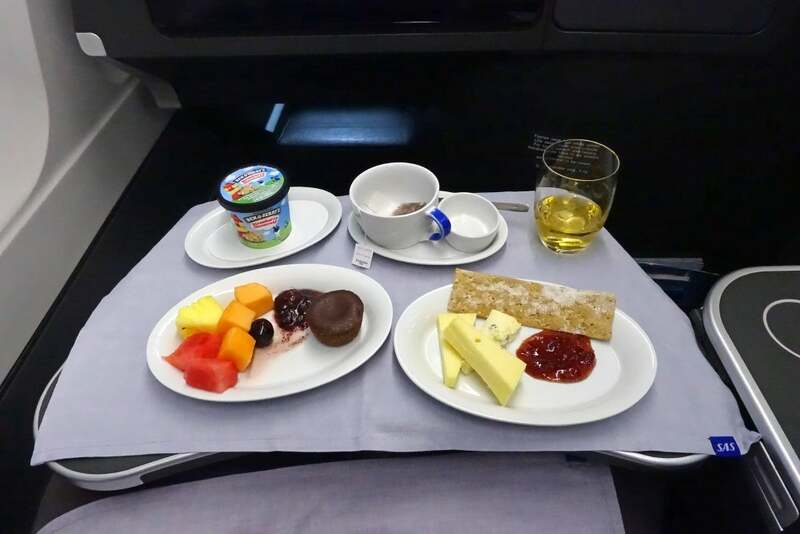 That was followed by a dessert and after-dinner beverage trolley — I went with a glass of Glenfiddich Whisky. 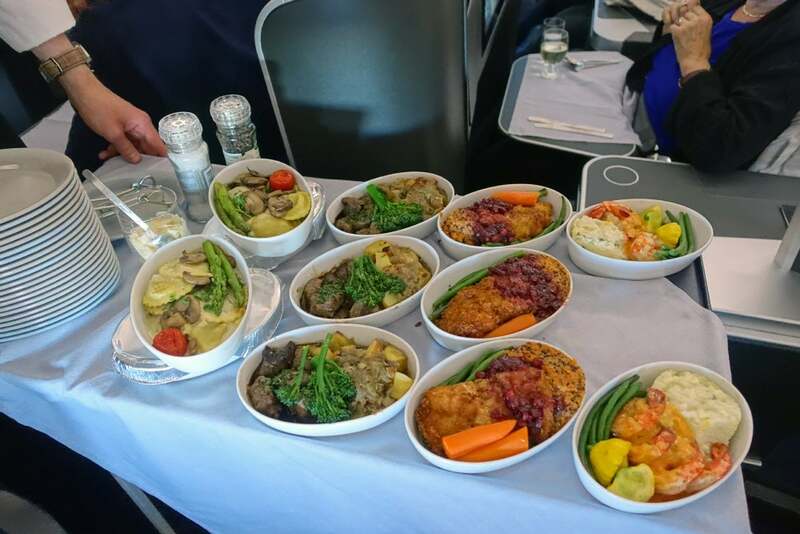 The main meal service finished about two hours into the flight, which is a bit longer than I might have preferred if I hadn’t been working on a review. 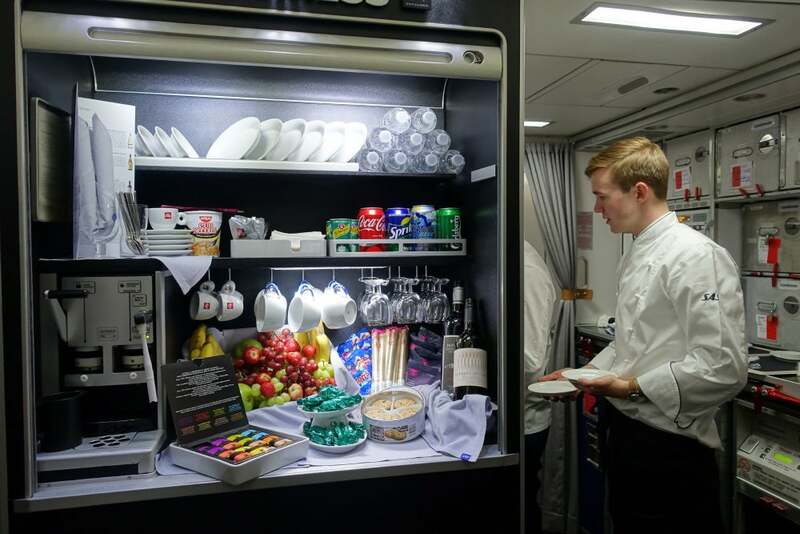 And as if that wasn’t already plenty of food, there was a snack selection set up in the rear galley, with a bunch of tasty treats that I definitely didn’t have any room for. 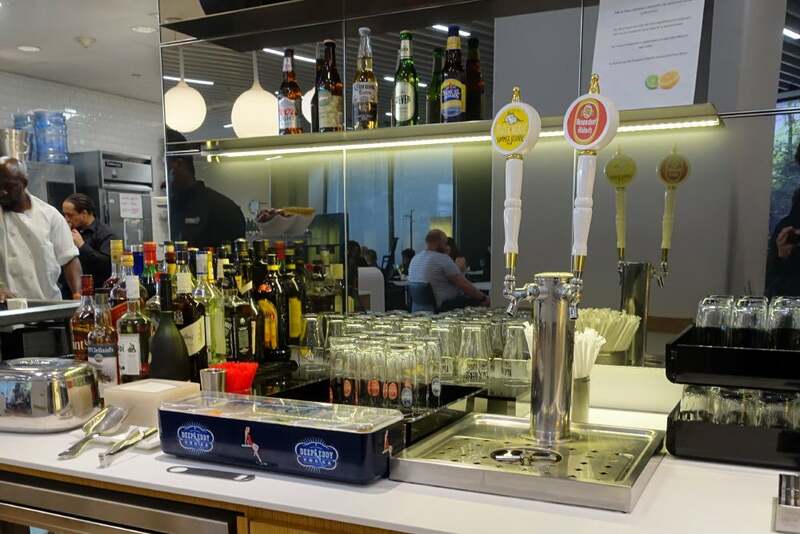 SAS operates nonstop flights that are much longer than this one, primarily out of Copenhagen and Stockholm, and I can see this self-serve bar definitely coming in handy on a flight to Hong Kong, Tokyo or even San Francisco. Then it was time for bed — the crew slowly dimmed the cabin lights. After a few minutes, the cabin was almost entirely dark. 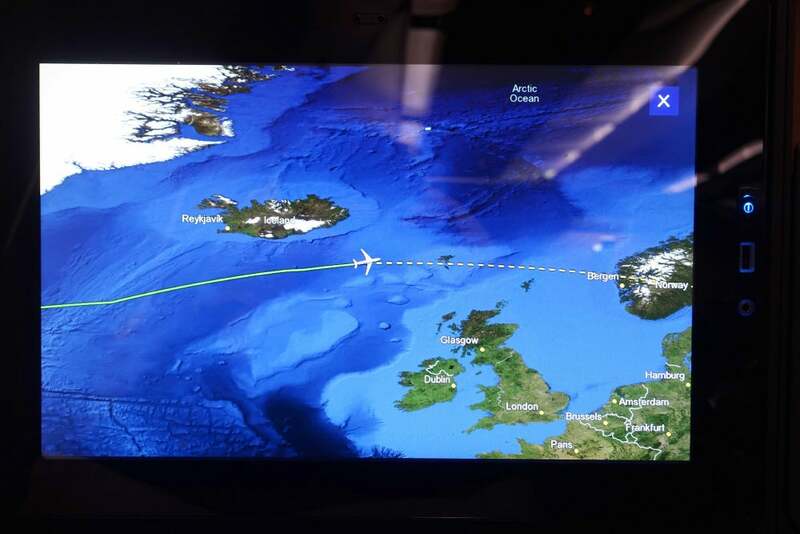 I slept for a little over two hours, and woke up just under two hours before landing, as we were roughly halfway between Reykjavik and Glasgow. 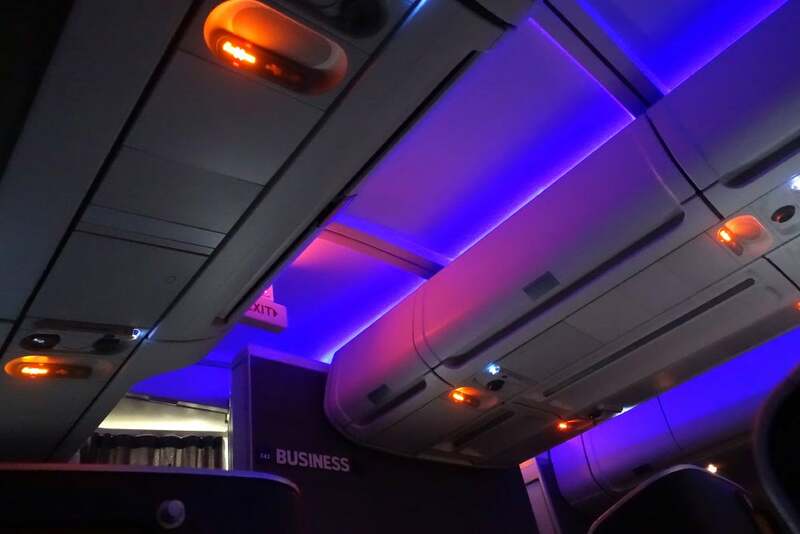 I would have preferred to get some more sleep, but the flight attendants turned the lights all the way up as they began preparing the cabin for breakfast. 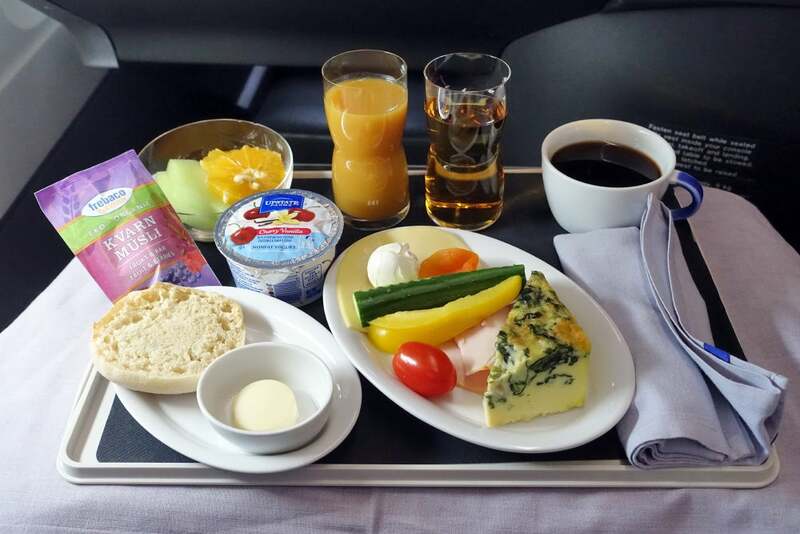 This meal was once again served from a trolley… breakfast options included yogurt, muesli, meats and cheeses, vegetables, a spinach and cheese frittata, fruit and smoothies. 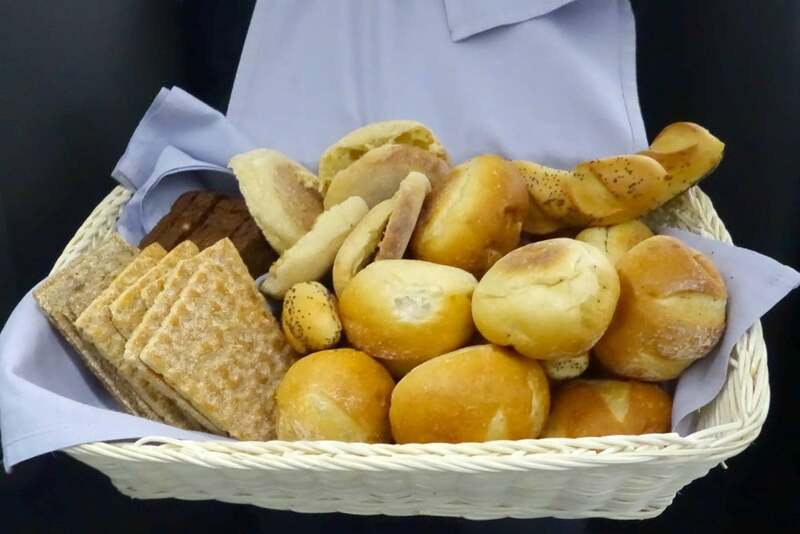 There was also a basket of bread — I opted for an English muffin. I still wasn’t hungry at this point, but I nibbled on everything — I even got a smoothie. 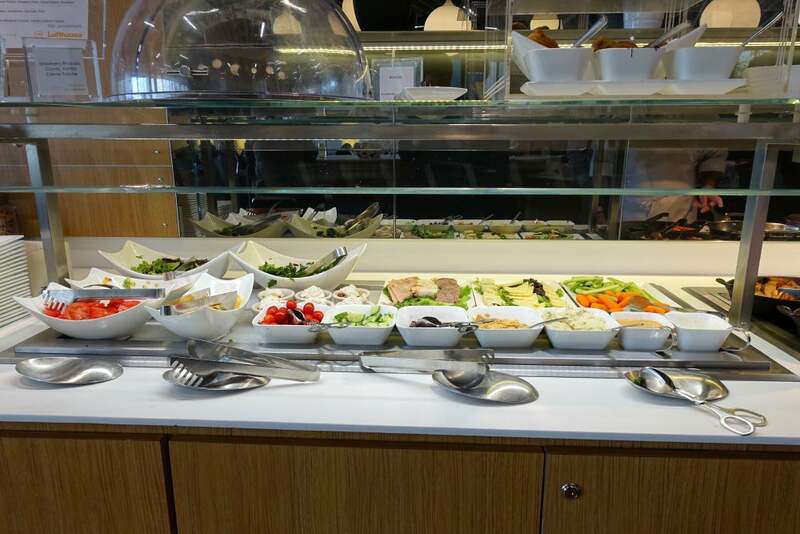 All the food was quite good, but the frittata was my favorite, and I certainly appreciated the Illy coffee! In all honesty, breakfast could have been served 30 minutes later and there still would have been plenty of time. 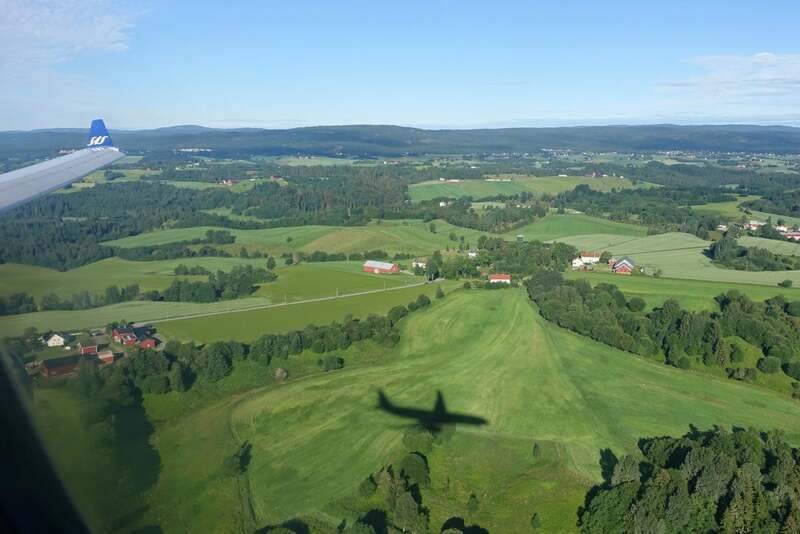 I spent my would-be sleep time watching our approach into Oslo. I honestly didn’t want this flight to end. 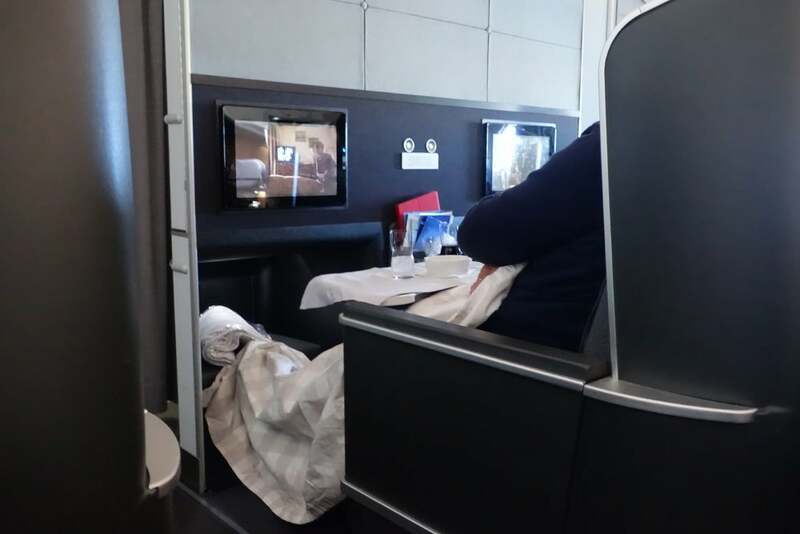 It was short, at less than seven hours in the air, and I could have easily spent another three or so hours relaxing and enjoying the seat, cabin and service. 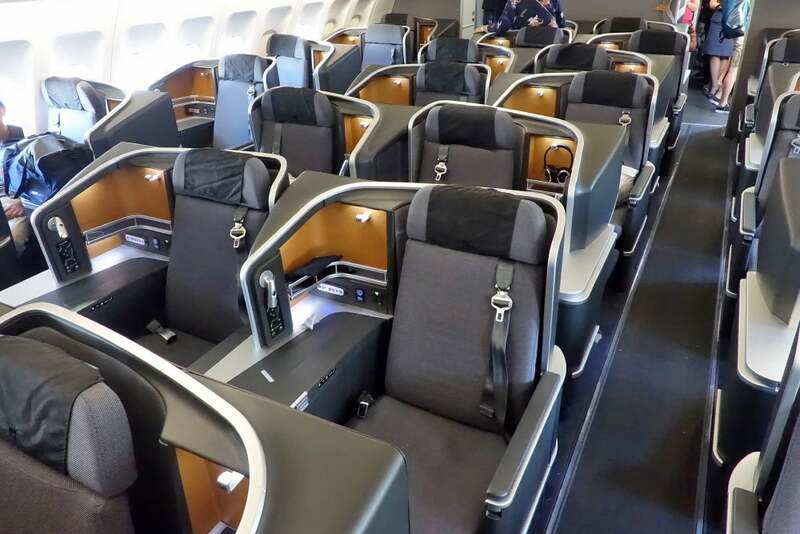 As with most business-class products, the seat you choose will have a big impact on your experience. 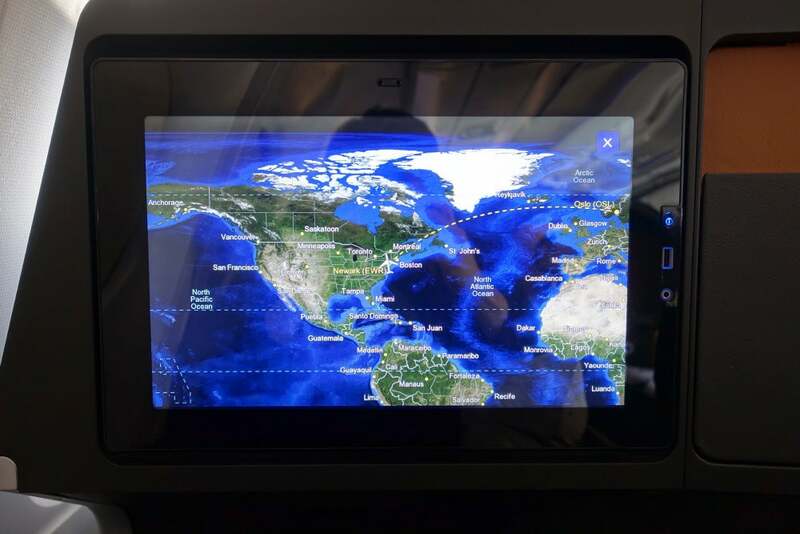 I flew in 2A, which I very highly recommend, though the middle seats provide some privacy as well (as you can see below), so don’t fret if you end up “stuck” with one of those. You can get a feel for the cabin layout by visiting SeatGuru. 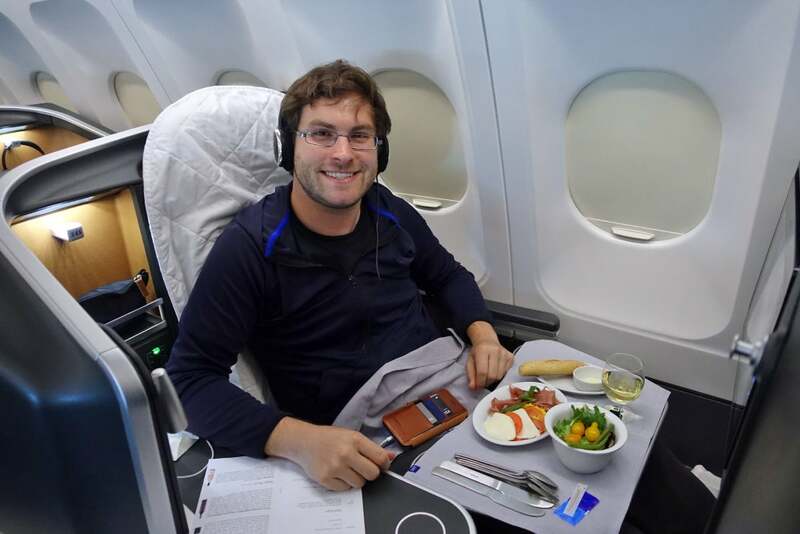 I’ve flown in some fantastic transatlantic business-class cabins over the past few weeks, including TAP’s new A330, the new Swiss 777-300ER (review coming soon!) 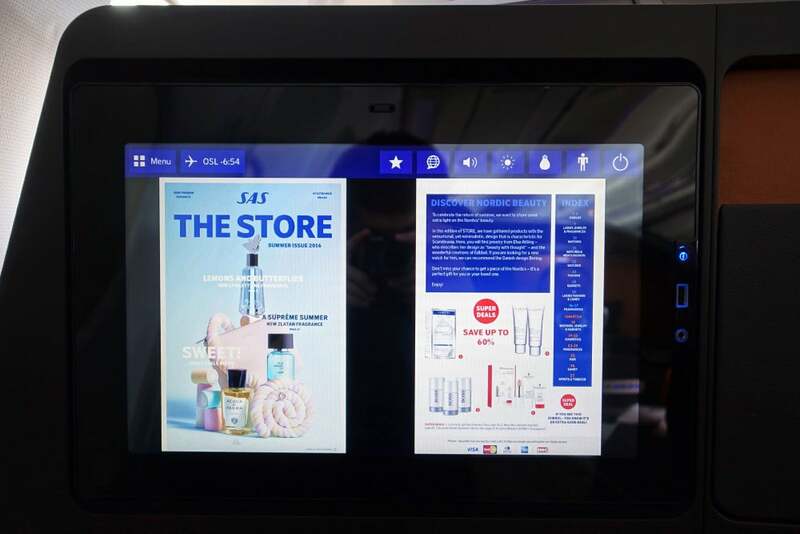 and Singapore’s A380 — between the seat, food and service, Scandinavian’s new A330 beats all of those products (yes, even Singapore!). 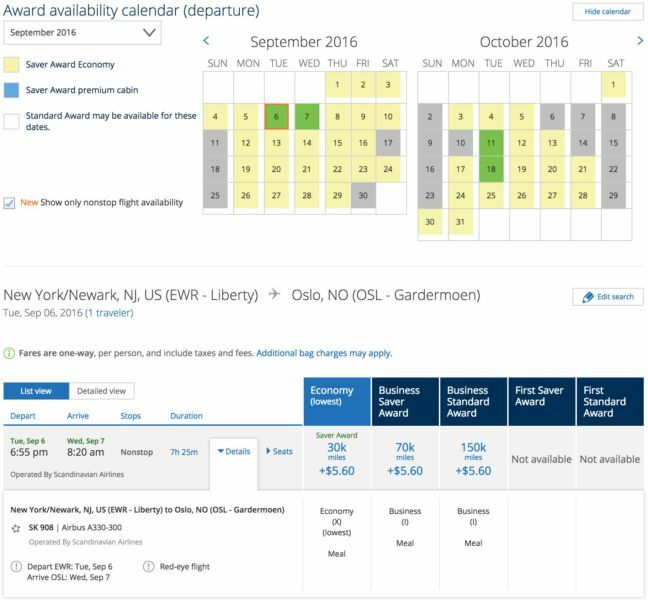 I only wish the airline offered better award availability — I wouldn’t hesitate to book this product for every flight across the pond, given the chance. 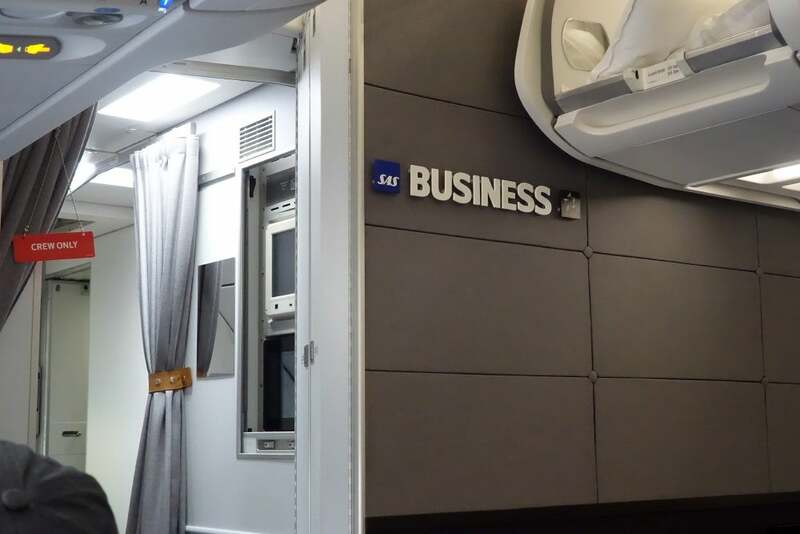 Have you flown Scandinavian’s new A330 biz?